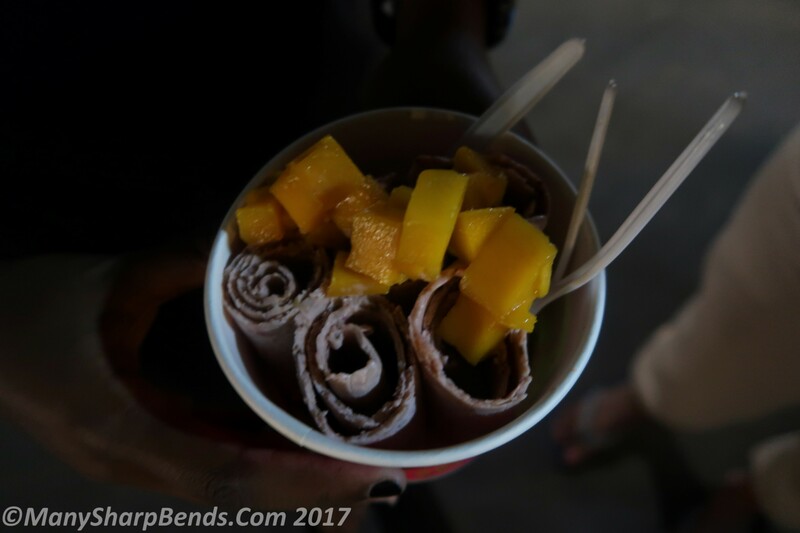 It’s gut-wrenching to write this blog. 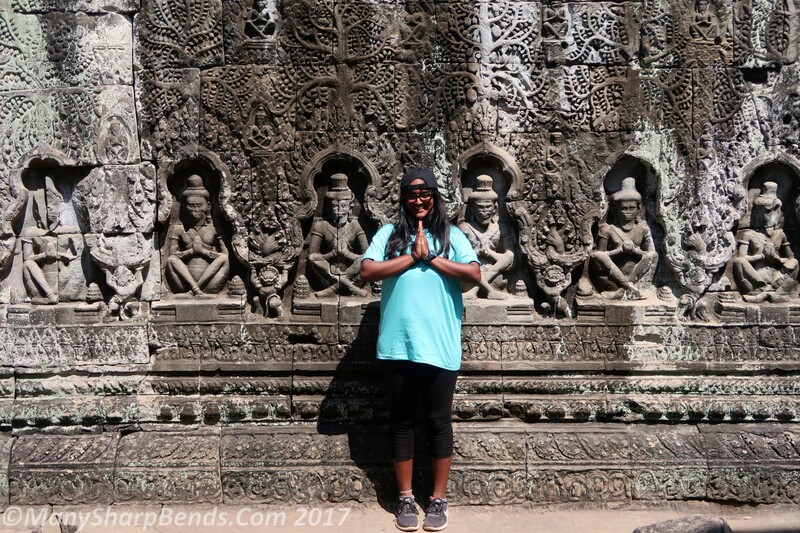 In the past 10 months, we have been to 5 continents and countless countries but Cambodia evoked special emotions like no other. You gotta feel for a country whose mind, body and spirit was broken not once, but twice in quick succession in the space of just a decade. 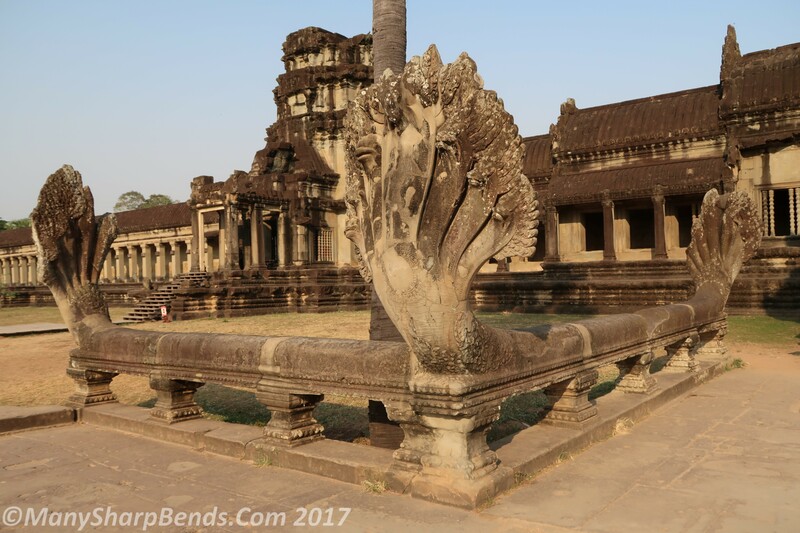 Getting caught in the crossfire of the Vietnam War in early 70s as collateral damage, Cambodia became one of the heaviest bombed countries in the world with America dropping 300,000 tons of bombs leading to 500,000 civilian casualties! 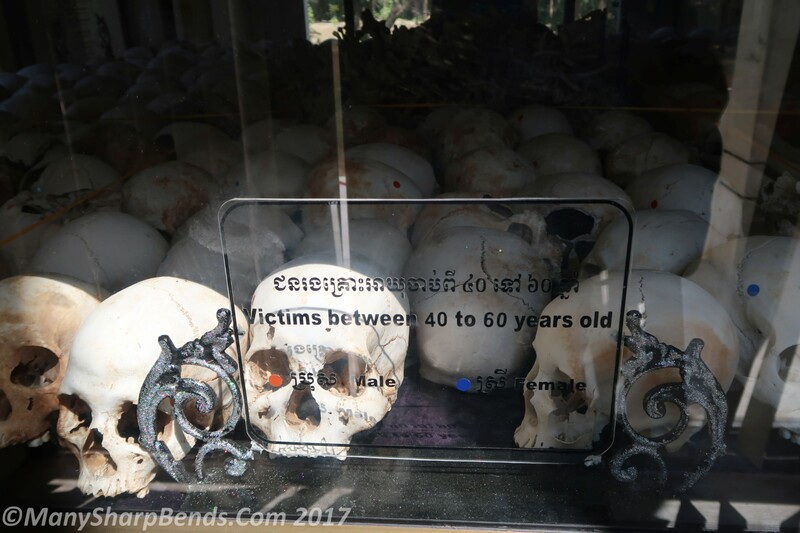 As soon as the war was over, one of their own – the deranged communist Pol Pot and his ultra-Maoist party the Khmer Rogue with utopian visions of establishing an agrarian society – executed 2 million Cambodians (mostly city folks) and moved the country back to dark ages. 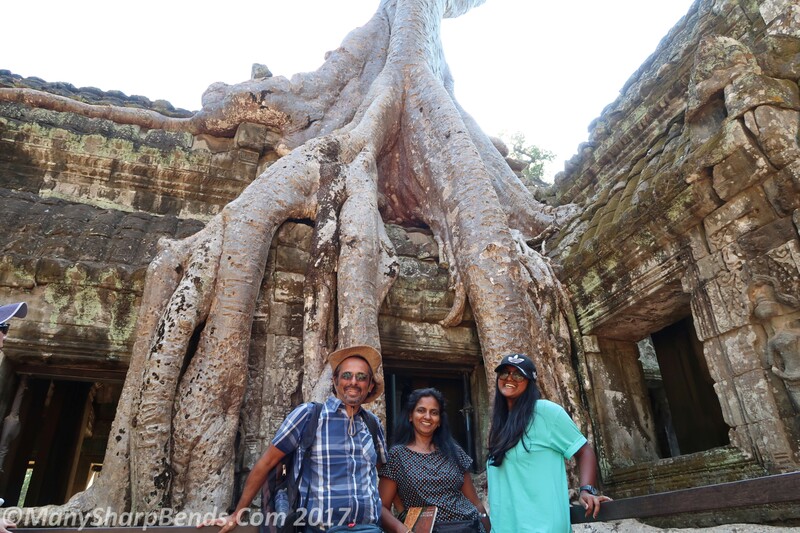 Thank God they did not destroy the Angkor temples which perhaps stand tall as the fitting symbol of the resilience of the Khmer people. 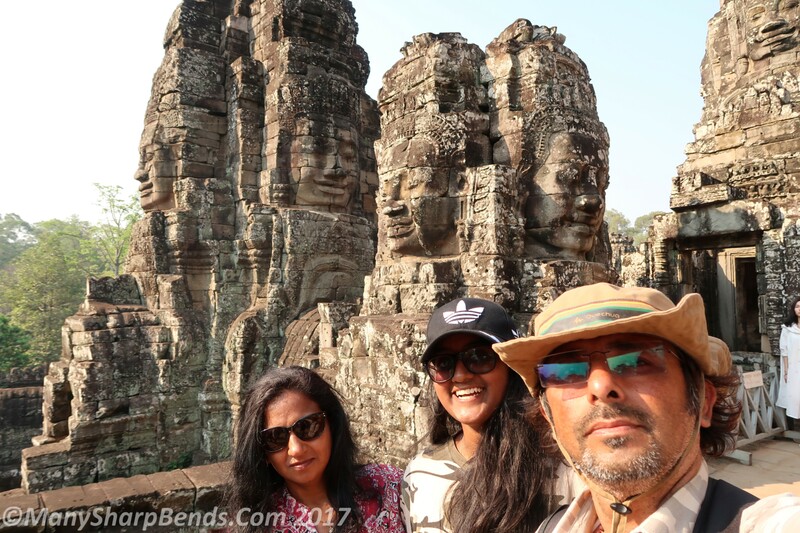 As we left Thailand and landed in Siem Reap, we were already wondering how Cambodia had managed to rebound after such a brutal modern history. 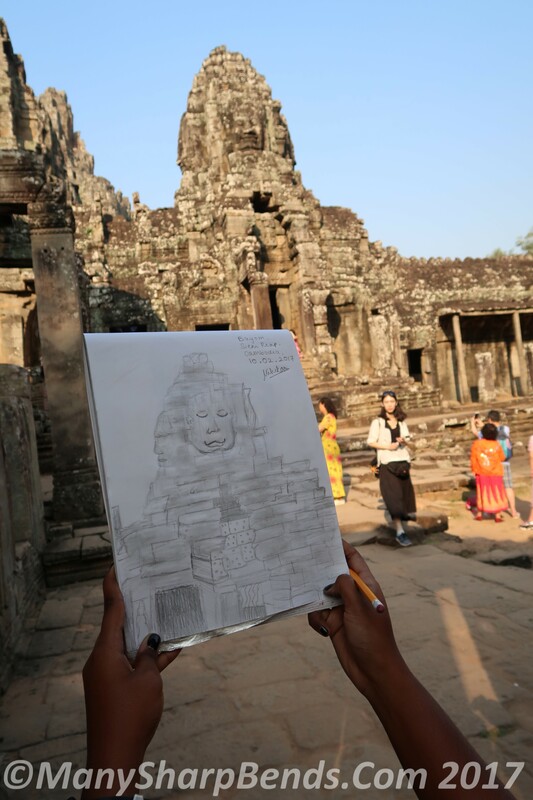 We got the answer within 15 minutes – its wonderful Khmer people. The sweet welcome at the airport by our ever-smiling tuk tuk driver Sukham (who would become the bedrock of our transport to Angkor temples over the next few days) followed by the helpful attitude of staff at the Villa Sok San hotel was enough to convince us that the Khmer people have come out of their tragic history and have moved on! 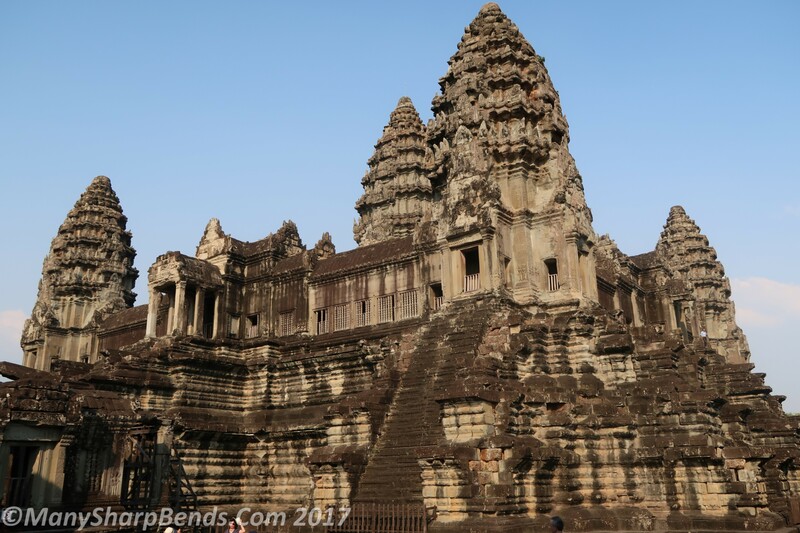 A quick primer: at its height, Angkor (here at Siem Reap) was the seat of the glorious Khmer kingdom between 9th and 15th centuries with a population of over 1 million. 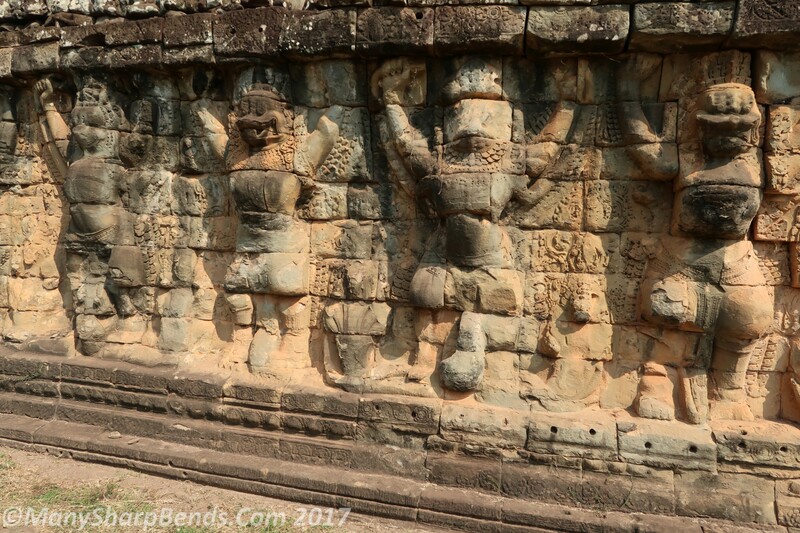 The Khmer kings (mostly Hindu, some Buddhist) built hundreds of temples dedicated to Gods Shiva & Vishnu – the most notable being Angkor Wat, Bayon (Buddhist), Ta Prohm , Banteay Srei, Banteay Samre and Preah Khan. It’s truly an embarrassment of riches. 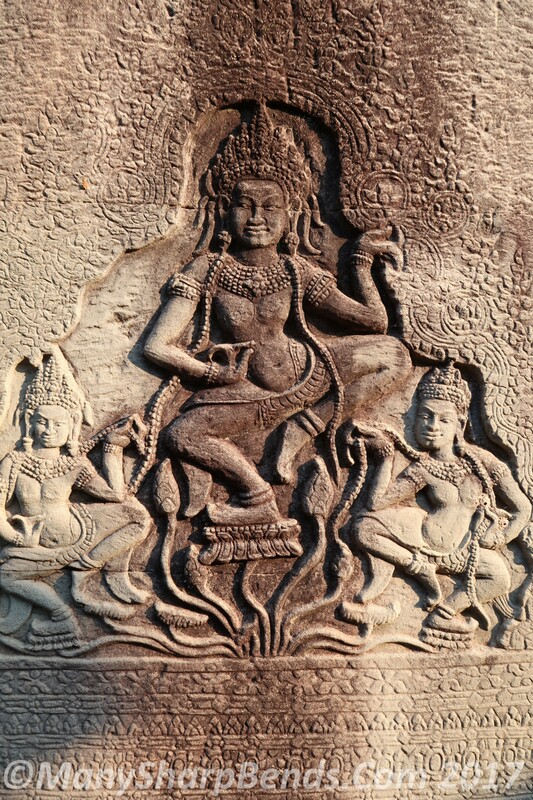 The Hindu influence came to Indochina from India via the trade route of Bay of Bengal. 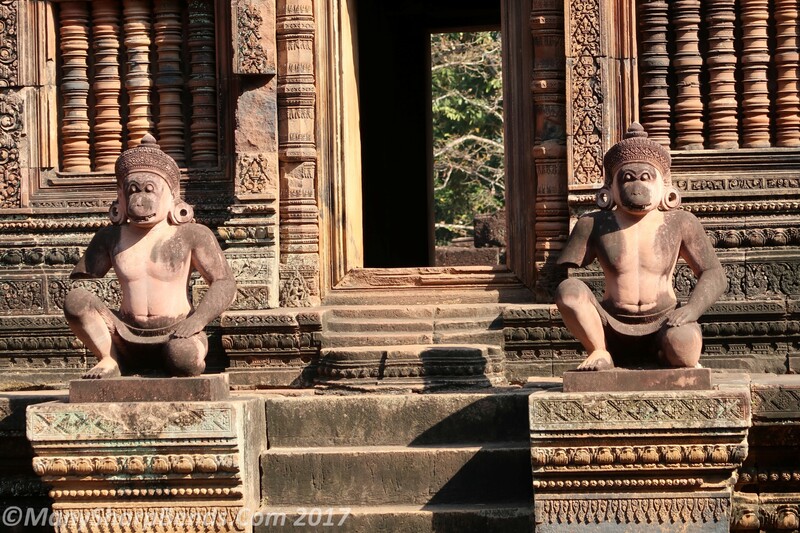 One needs 3-4 days to see the main temples at a relaxed pace as they are spread far apart. 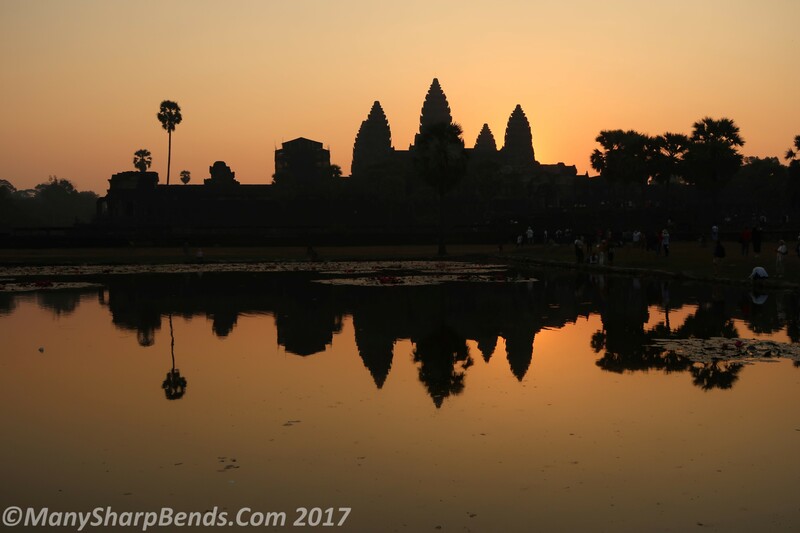 After a quick nap, we headed off to Angkor Wat (AW) for the sunset, which frankly, was a little underwhelming! The next morning, we woke up at 5 am to join literally thousands of people, for AW sunrise! Quite a shock specially when you want exclusive rewards for waking up so early. It was more fun watching the photographic circus than the sunrise itself, which by the way, was far superior to the sunset. 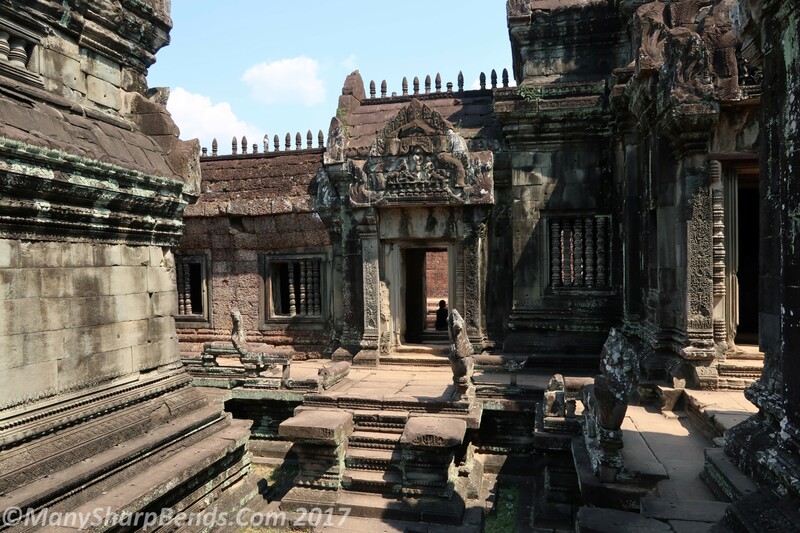 Based on the sun direction, we had optimized our temple-route to maximize our photographic opportunities. 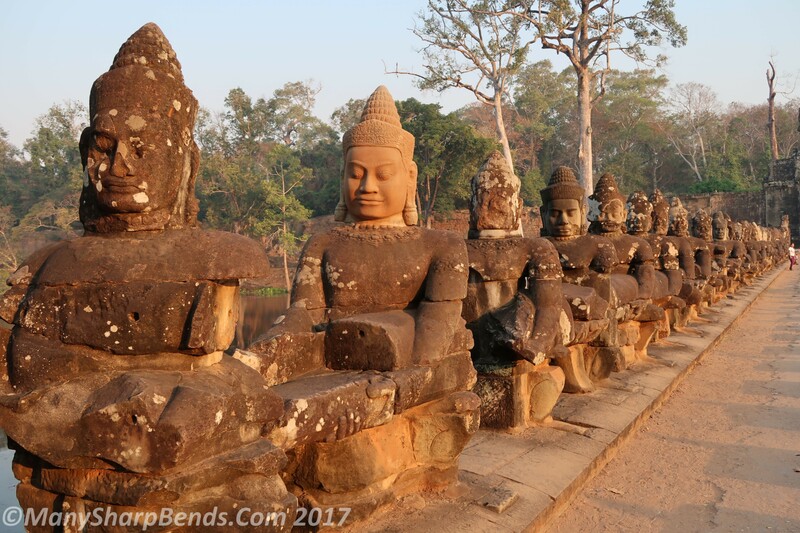 According to plan, after sunrise we immediately headed off to Angkor Thom and the Bayon temple. 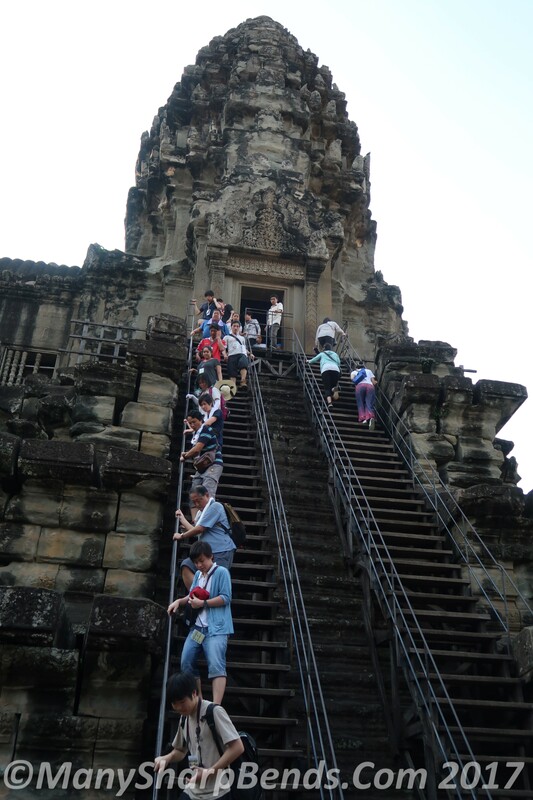 Angkor Thom is the name of the larger complex within which its main attraction Bayon temple is situated. 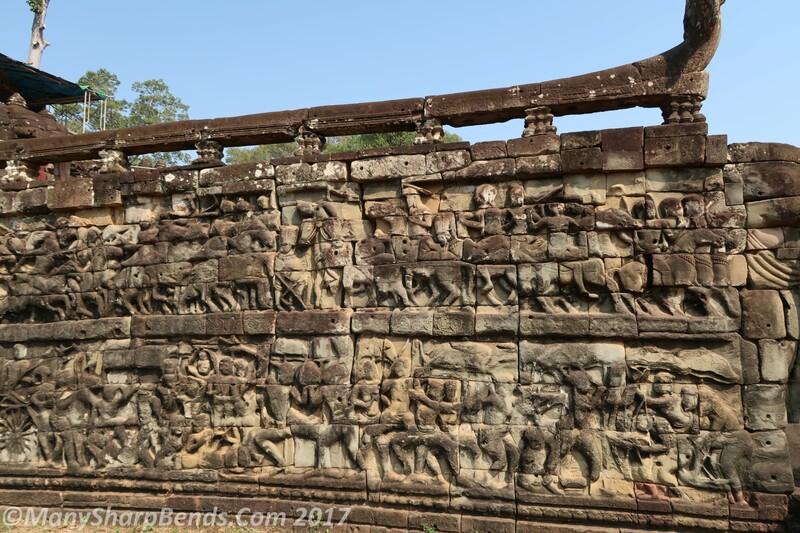 The first glimpse of Angkor Thom south gate with 54 Devas and Asuras on each side representing the churning of ocean milk, is mesmerizing. 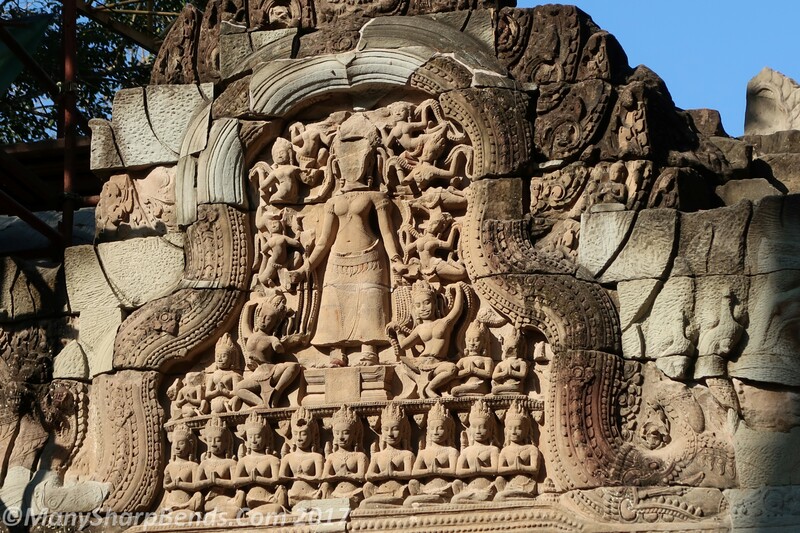 The towering statues of Bodhisattva Avalokitesvara above the gate gives it an truly imposing feel. 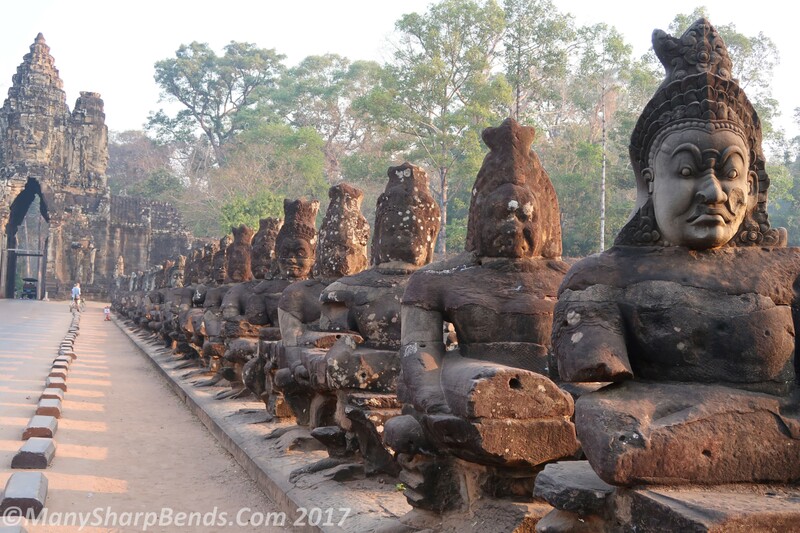 Bayon, with its 54 towers depicting smiling statues of Avalokiteshvara (with a hint of Jayavarman VII’s face – the king who built it) is breathtaking. 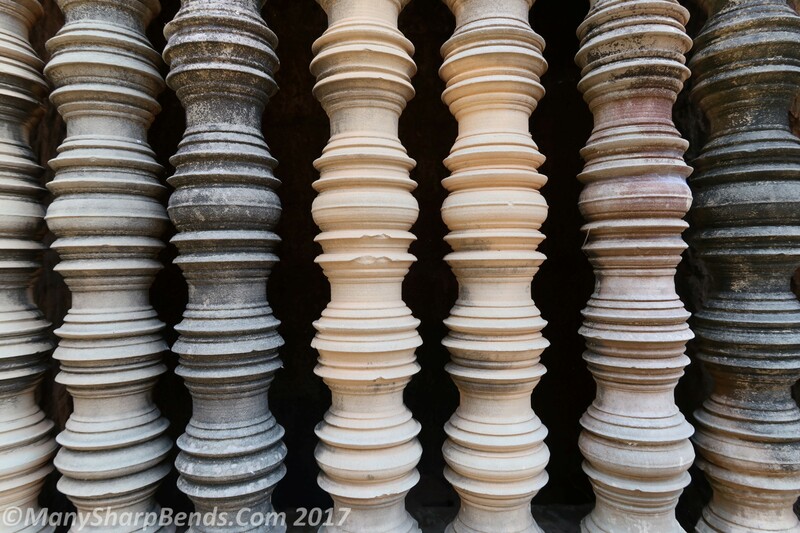 Whichever angle you look from, the statues exude the king’s power. 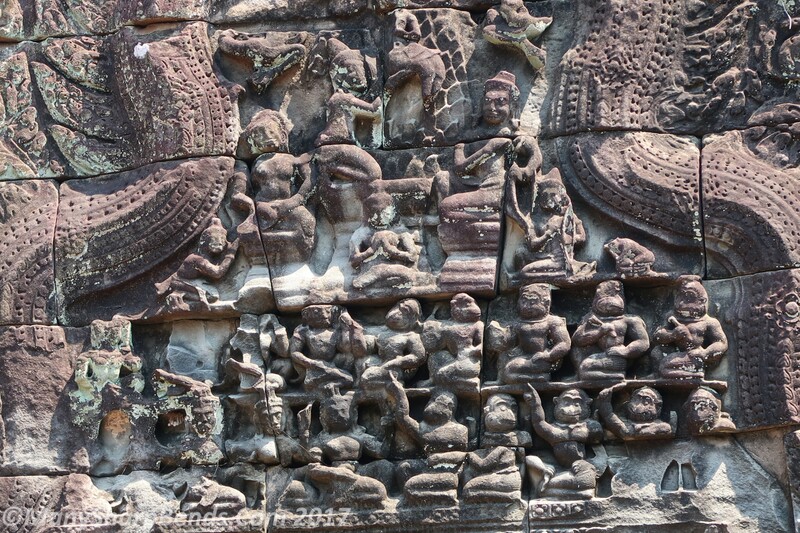 The bas-reliefs add a beautiful dimension to Bayon. Mika produced a lovely sketch on the spot. 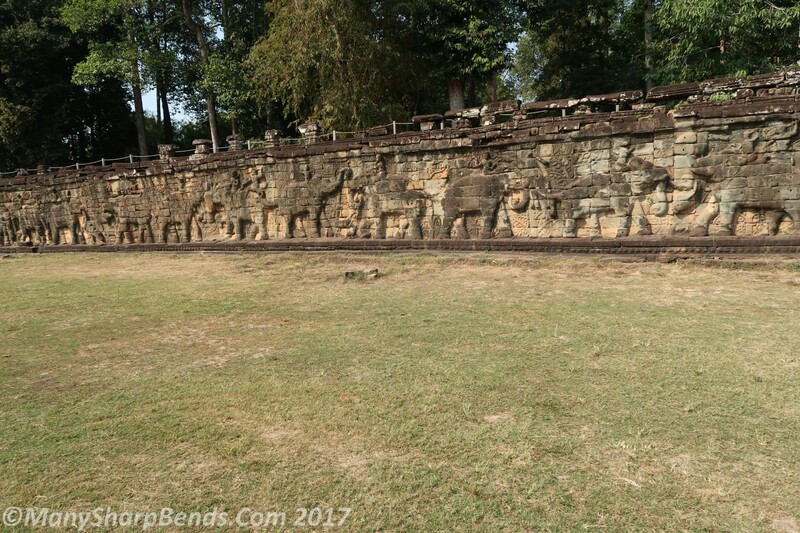 Next we headed off to the Baphuon temple followed by the Elephant Terrace – which was used as a huge platform for watching ceremonies. 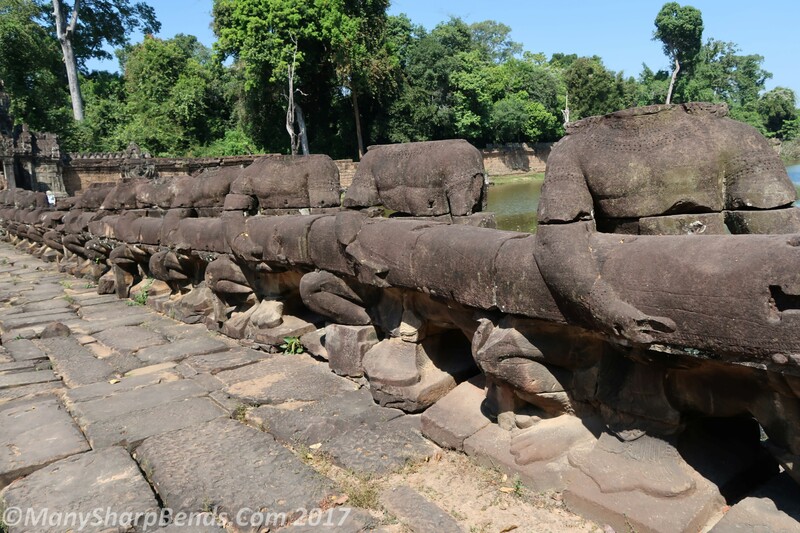 The adjoining platform is called Terrace of the Leper King to support the legend which says at least two Angkor kings had leprosy. By now it was insanely hot and we took a lunch break followed by a power nap. We then headed back to the big daddy AW for the third time, this time to explore it properly from the inside. 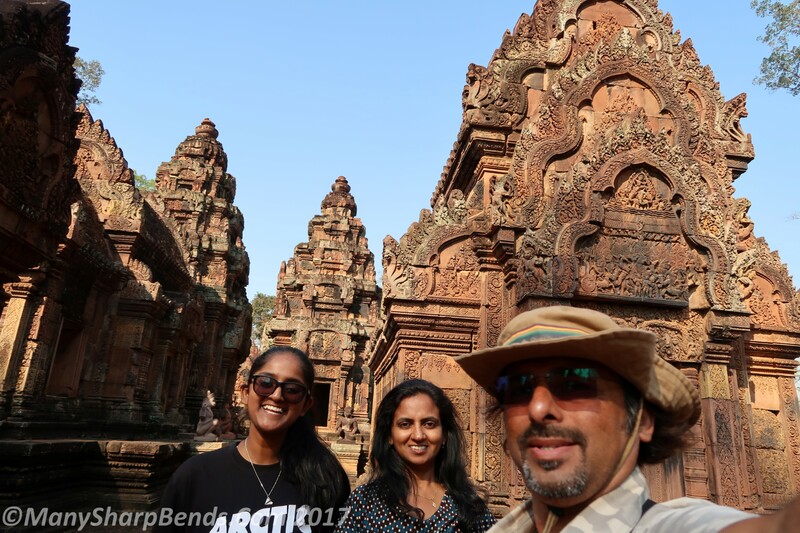 In retrospect, it turned out that we loved Bayon and Banteay Srei more than AW – I guess its a matter of taste. Sometimes overcrowding influences your likes and dislikes – the crowds at AW are obviously not for the faint-hearted. 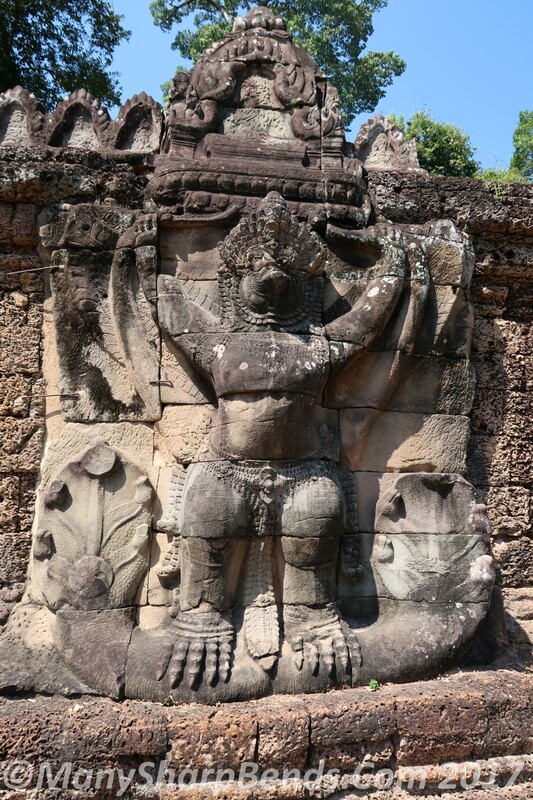 Built by Suryavarman II, AW is dedicated to lord Vishnu. 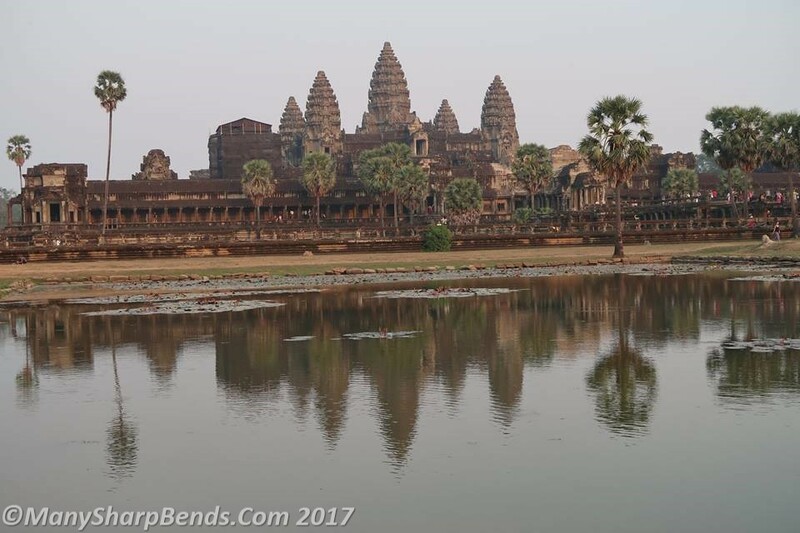 Its an impressive and massive complex surrounded by a moat on all sides. 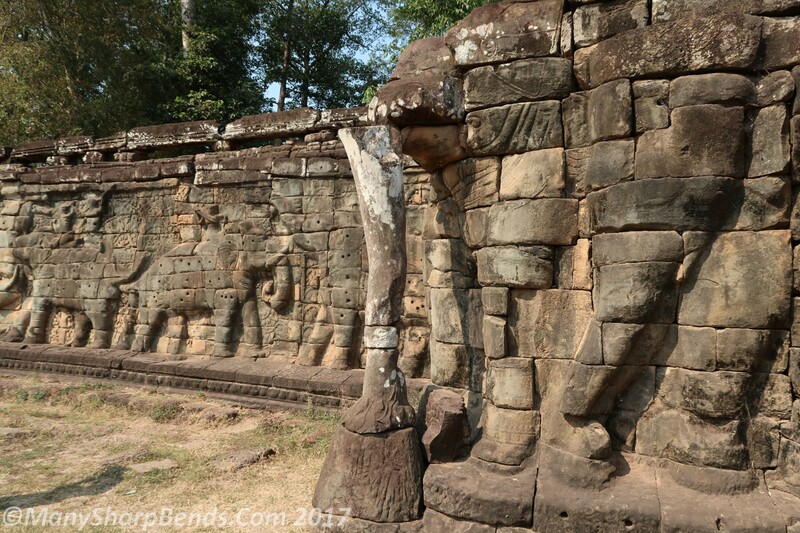 The stone blocks to build it were quarried from 50 Kms away! 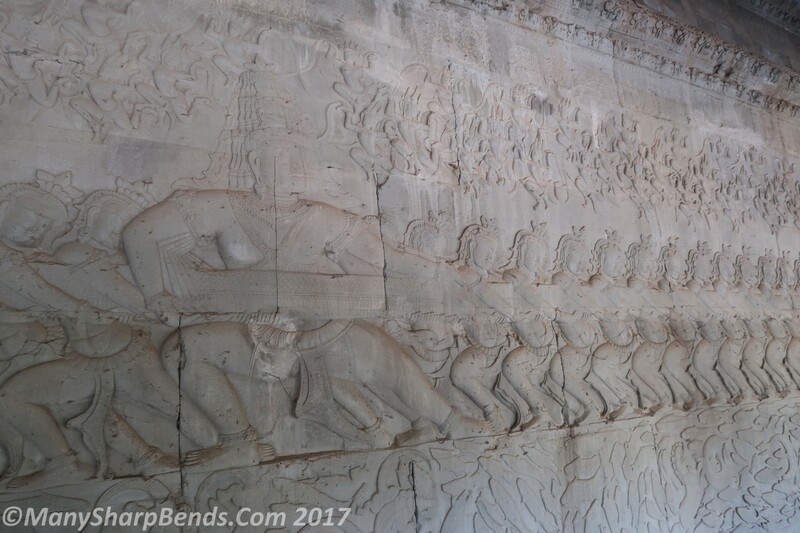 The bas reliefs are most impressive and if you know your Ramayana and Mahabharata, you would love it ! 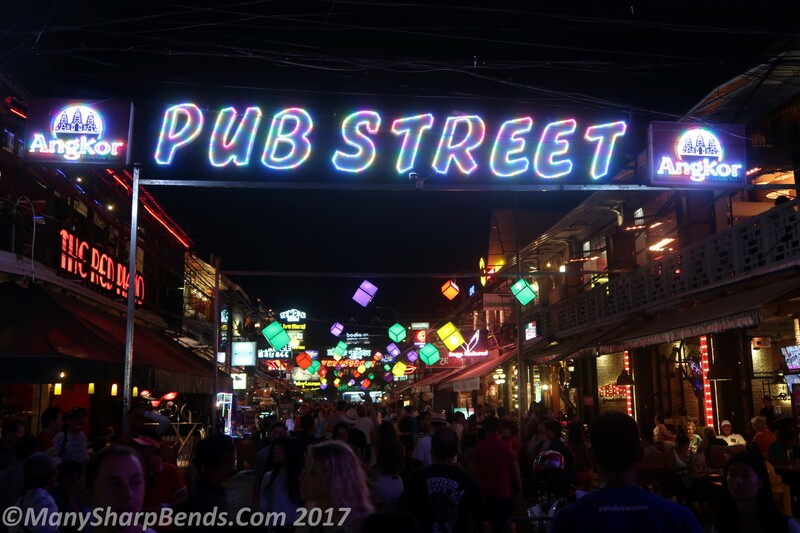 It’s the end of a long and tiring day and its time to head to Pub street which frankly is a tourist trap. 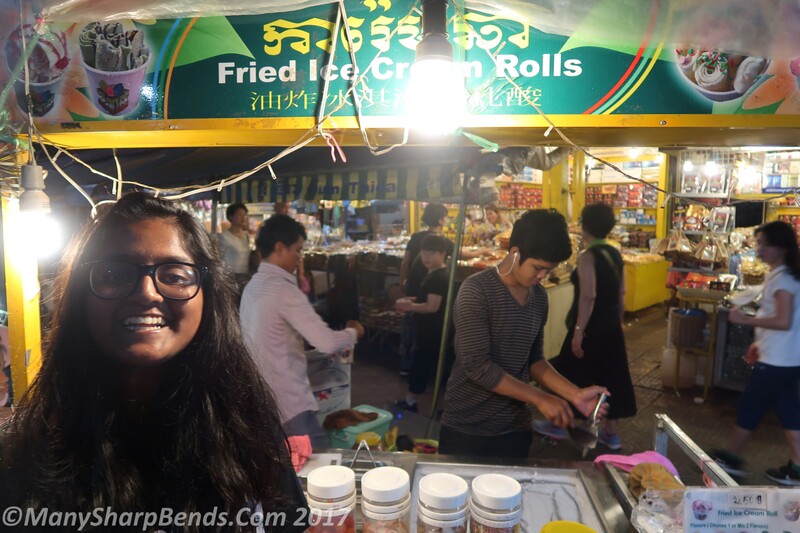 We managed to find some vegetarian food followed by fried ice cream rolls for Mika. She loved it! 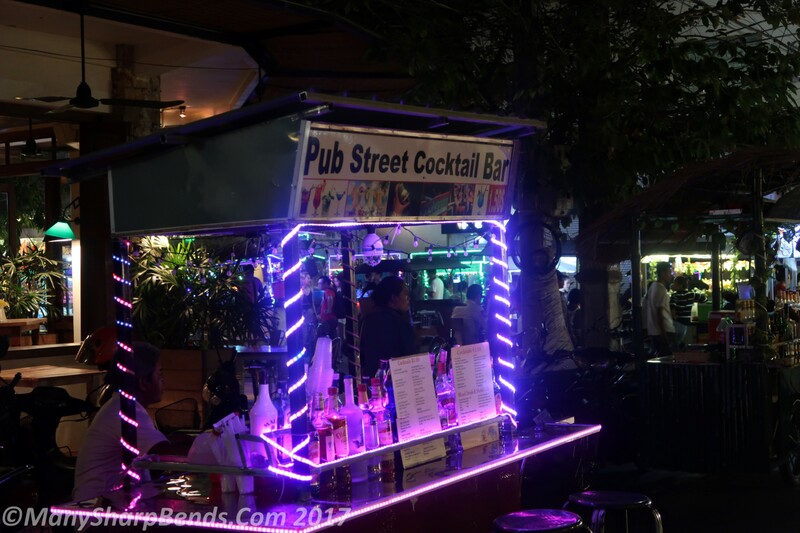 It was a wild scene on the streets – have you ever seen cocktail bars on carts before? 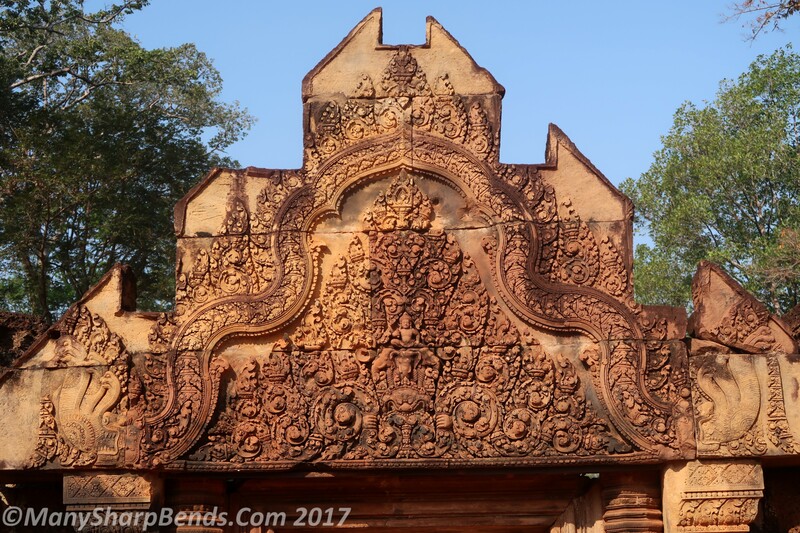 Next morning we headed off on a long 90 minute tuk tuk journey to Banteay Srei – the hidden jewel of Angkor and the man of the match in our opinion. 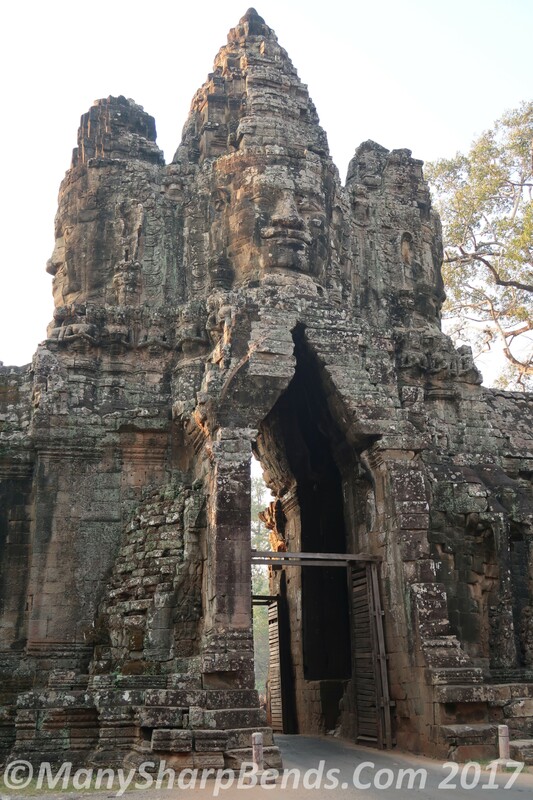 Interestingly it was not built by a king but by one of the officials. 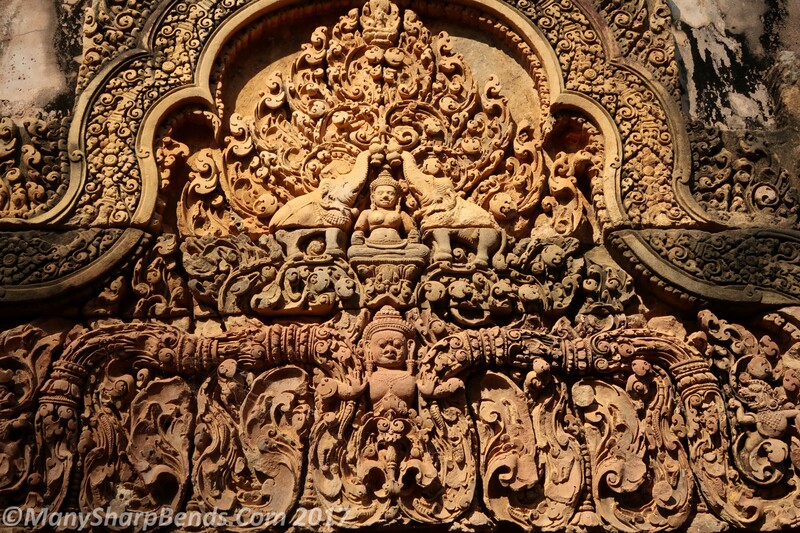 We were simply blown away by the intricate sand stone carvings. 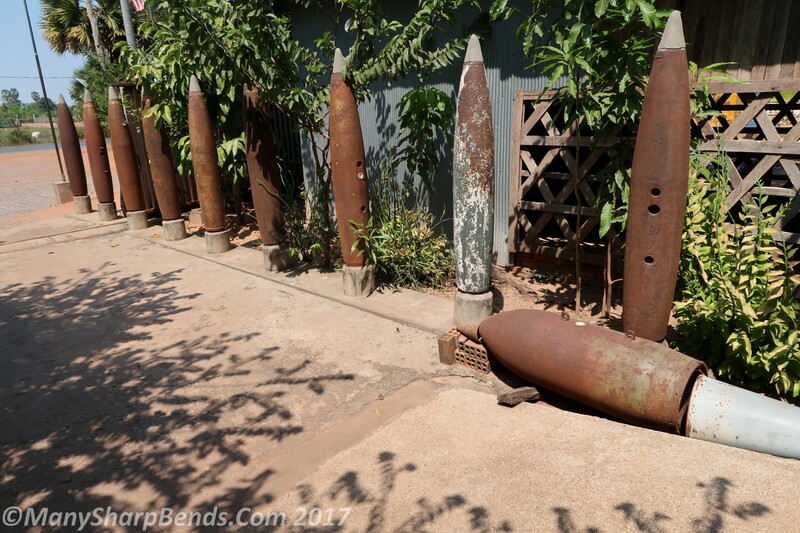 We headed to the nearby Landmine museum founded by the Khmer man Aki Ra, who has dedicated it to thousands who were affected and continue to be affected by the dormant landmines laid out / air-dropped during Vietnam war. 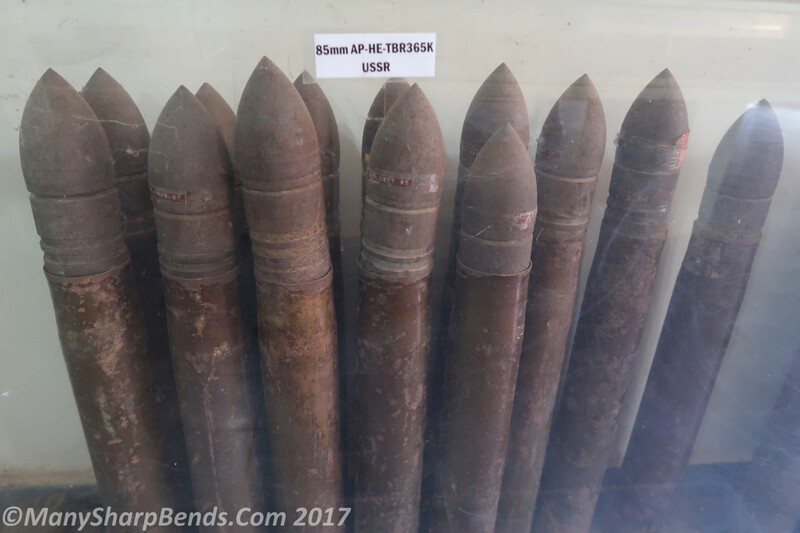 We were heartbroken to learn that USA dropped 300,000 tons of bombs secretly (without the senate approval!) 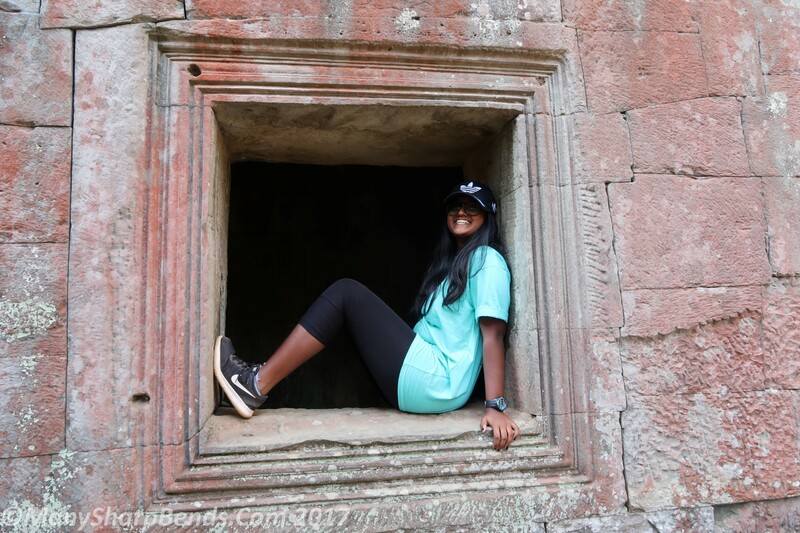 on the Ho Chi Minh trail in Cambodia, killing half a million people (during the Vietnam War). Example of stupid things powerful nations can do to smaller ones. 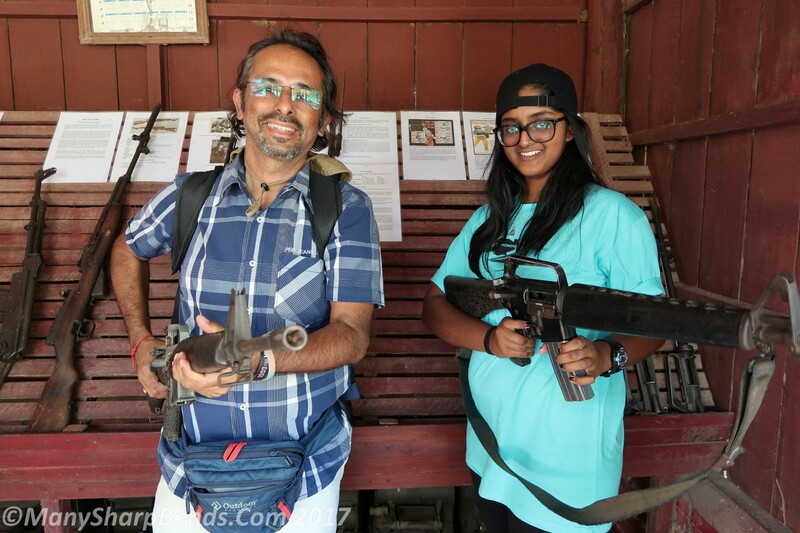 The museum gave as an insight into how children like Aki Ra were recruited by the Khmer Rouge in the days following the US bombings, how many of them fought on different sides with no understanding of what was happening around them. 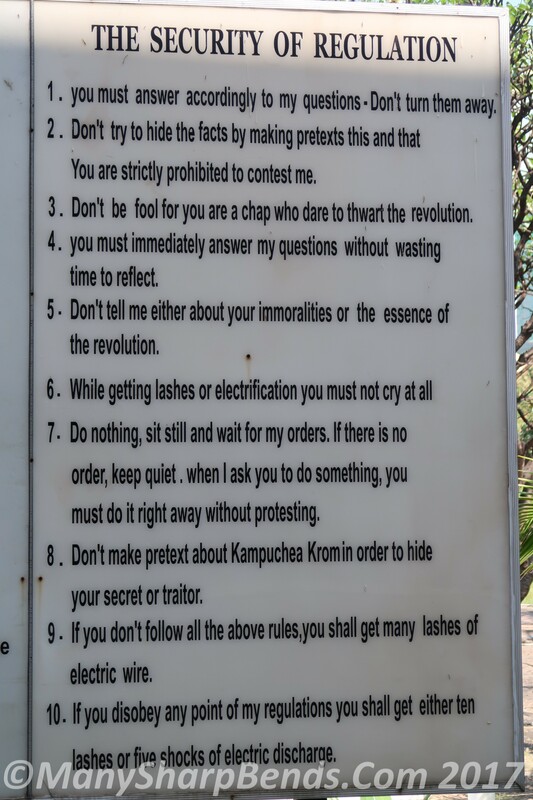 It all is very complex and we still could not fully comprehend how the Khmer Rouge came to power. 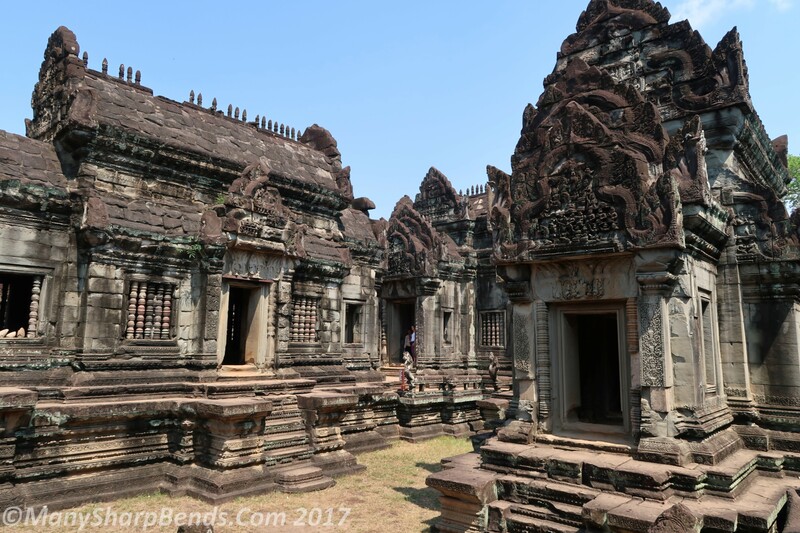 We were not expecting much from our next stop Banteay Samre but the isolated temple with its architecture, won us over. 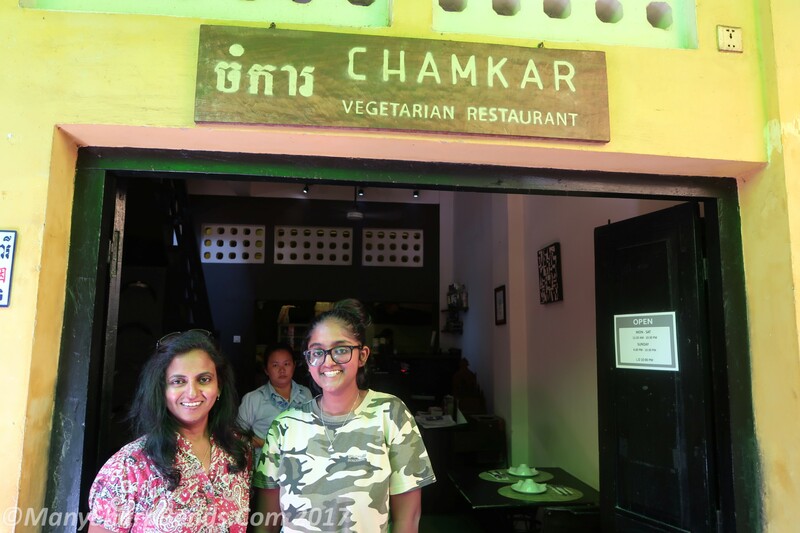 The lovely Cambodian curries at at the pre-researched vegetarian restaurant Chamkar obviously resulted in a lot of brownie points for me. 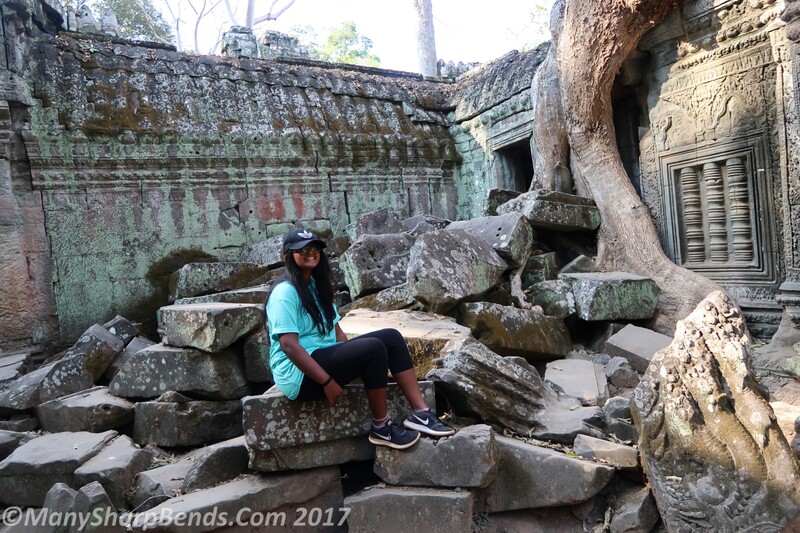 We kicked off our last day with the atmospheric Ta Prohm Buddhist temple set amidst a jungle with roots of ancient trees making their way through the temple structure in many places. 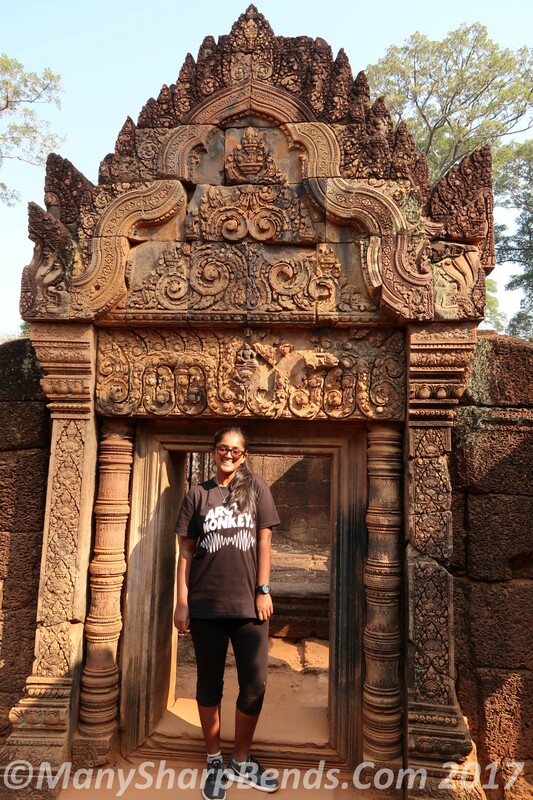 It has been immortalized by the Angelia Jolie starrer Lara Croft: Tomb raider. 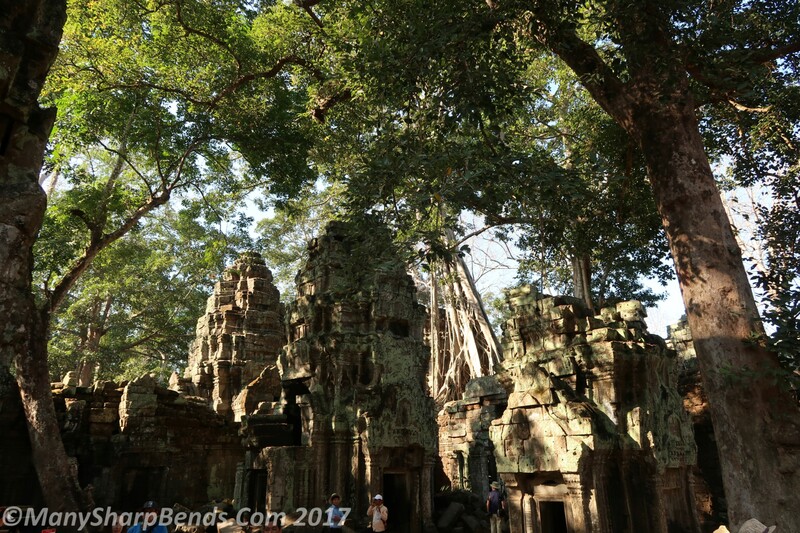 Completely different from the more organized and structured Angkor Wat: Ta Prohm is wild, unstructured, uninhibited and we loved it. 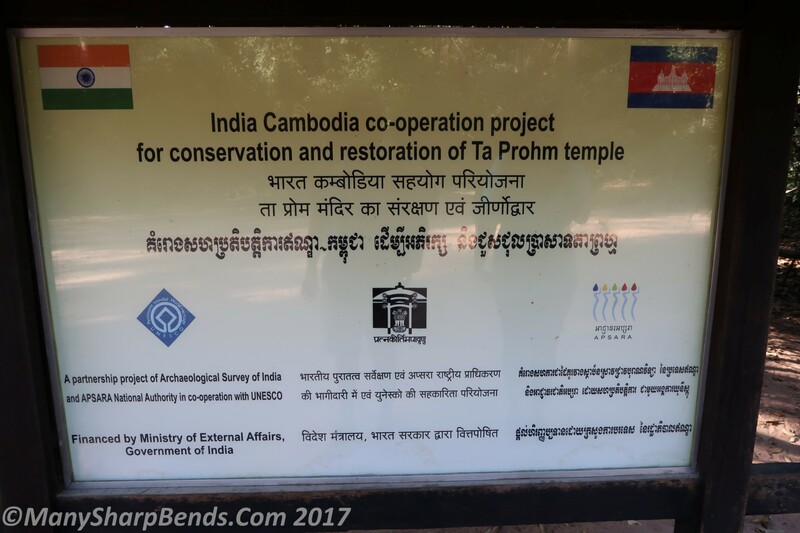 Of special proud mention is the ASI’s (Archaeological Socieny of India) involvement in the temple’s restoration. 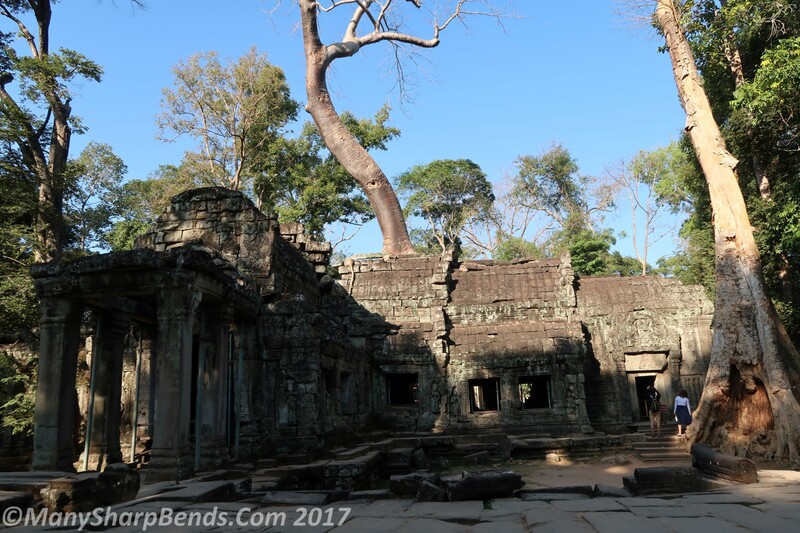 Our last temple of the day was the beautiful Preah Khan. 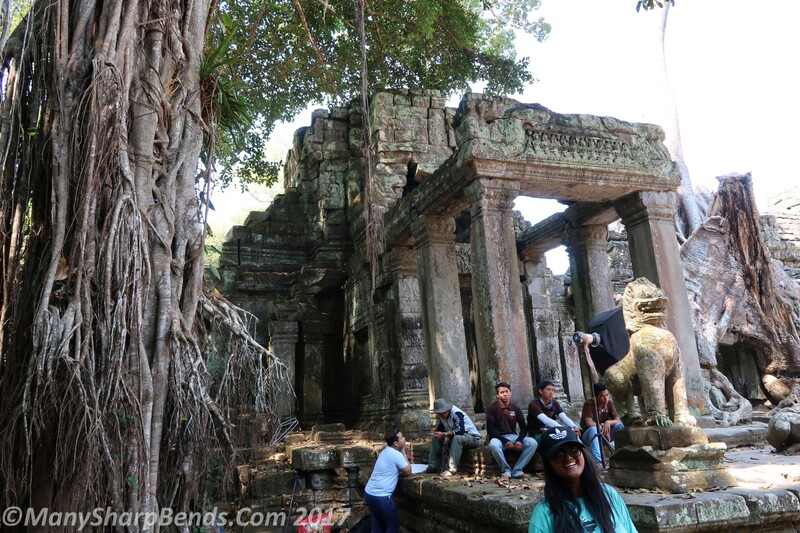 The lesser the crowd, the better the ruins ! 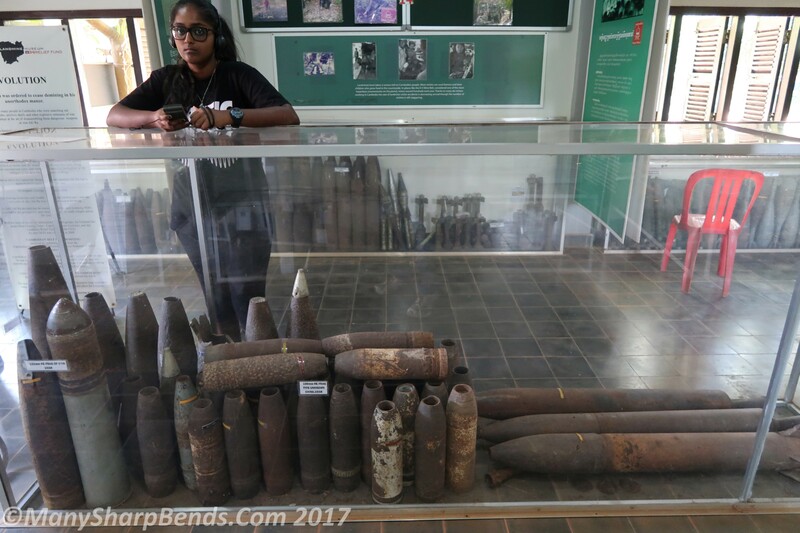 Our last stop was the War Museum at Siem Reap which was made really interesting by the guide who was an actual war veteran. He showed us ball bearings still embedded in his body from the war and landmine days ! It was here in a clear chronology of events that we understood how the Khmer Rouge came to power in the years following the 1970 US-backed coup to overthrow prime minister Norodom Sihanouk, (the last in line of the Angkor kings, who had campaigned for freedom from French colonial rule and abdicated his throne after independence) with a stated neutral stance but a slightly left inclination. 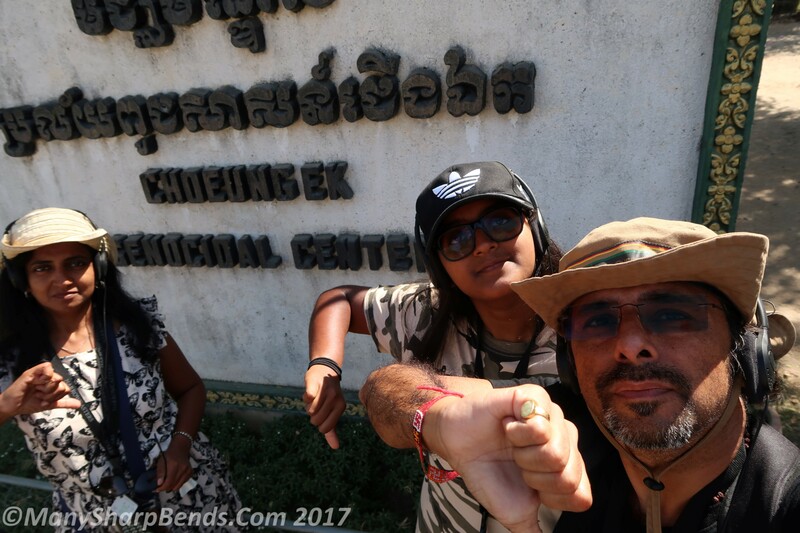 Our Angkor adventure had come to an end it was time to move to the capital city Phnom Penh to better understand the horrors of Khmer Rogue. 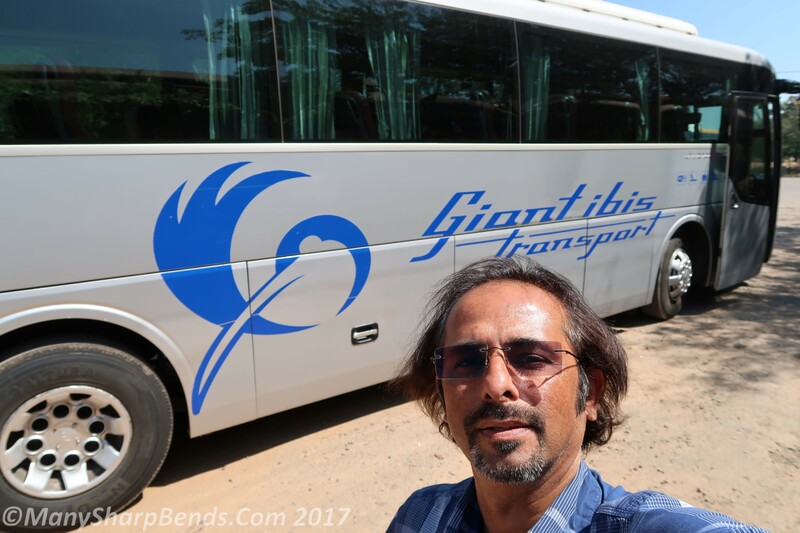 A very comfortable Giant Ibis us whisked us to PP in 6 hours. 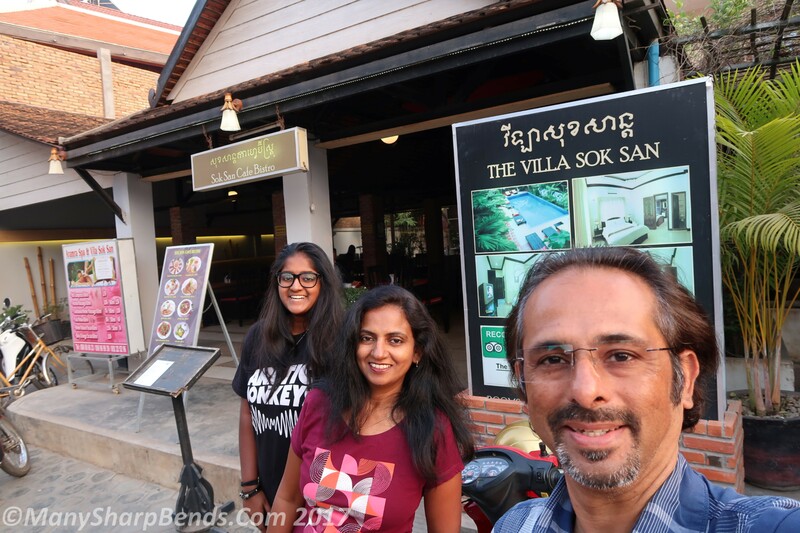 I made full use of my time and mobile data to finish the Thailand blog. Time management ! 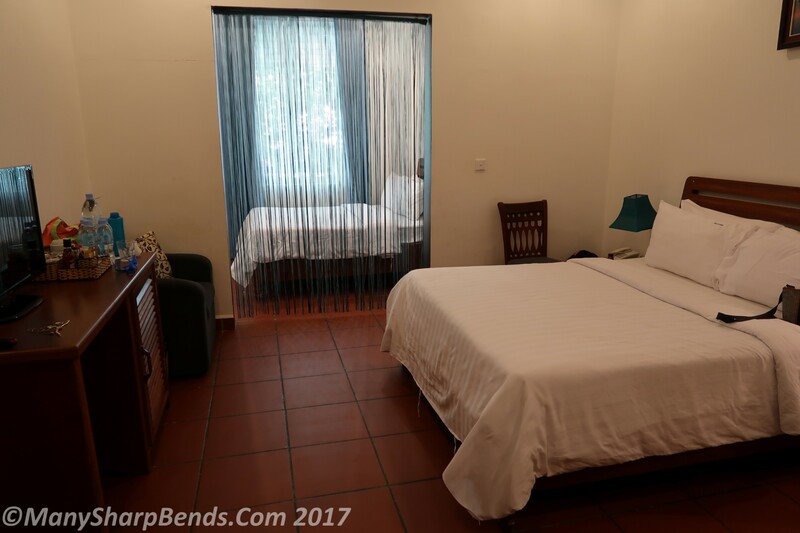 The stylish Blue Corner Boutique hotel turned out to be one of the best of the whole world trip. After a satisfying dinner at the nearby Indian Veg restaurant run by a Mumbaikar, we got lost on the way back to the hotel but google maps once again came to the rescue. 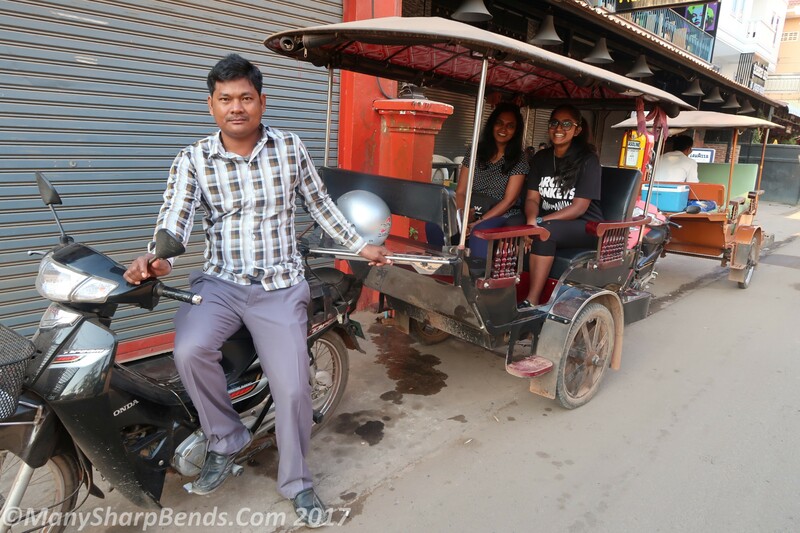 It is amazing how much of a leveler technology is – countless times on this trip we have corrected taxi drivers and given them directions on their home ground much to their annoyance ! 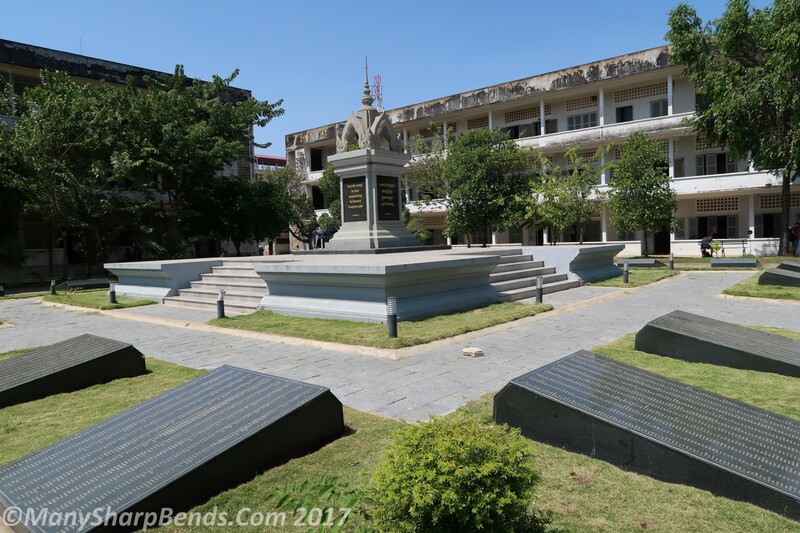 On a day that the world was celebrating valentine’s day, we visited its anti-thesis in the form of Tuol Sleng Genocide museum and were moved to tears. 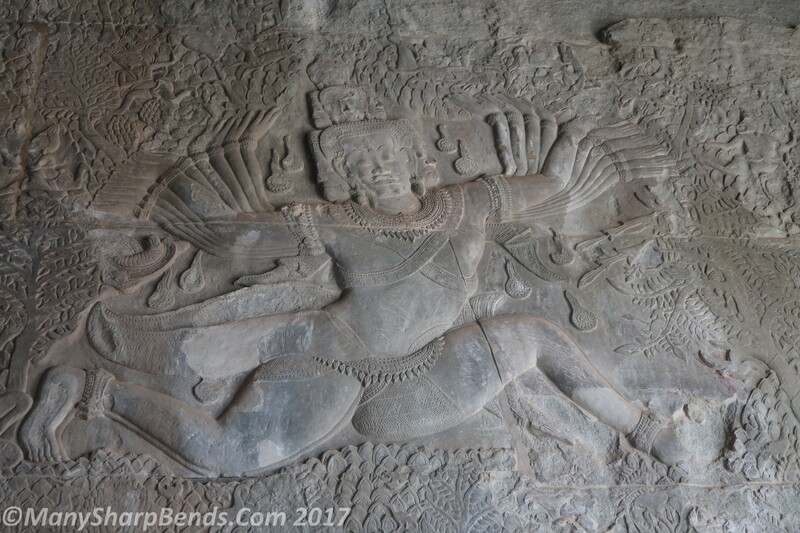 The Cambodian civil war in 1975 was won by the communist Khmer Rouge – an organization with the flawed and demented vision of turning Cambodia into a giant agrarian society in which there was no place for education, religion, sports, entertainment and intellectuals. 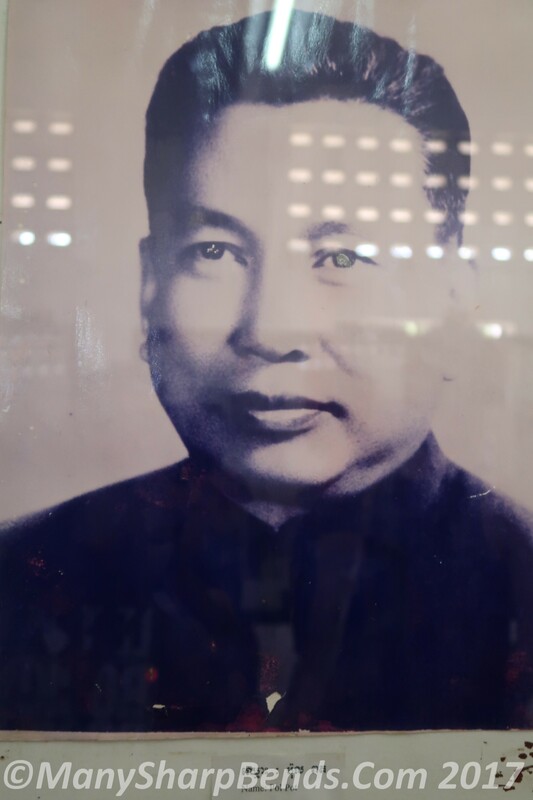 They were led by Pol Pot – the deranged leader who was inspired by Maoist ideas during his education in Paris. 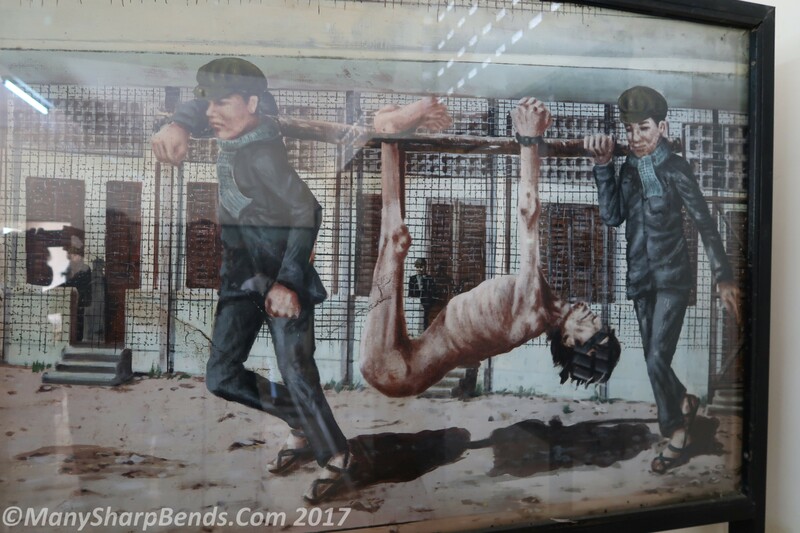 The genocide that he inflicted on his own people (2 million out of 8 million total population were executed) in the name of social re-engineering is a chilling example of how countries can be doomed under mad, unbalanced, one-sided leadership. The recruits were poor 15 year olds from the countryside who had no idea what they were fighting for. The population was divided into “new folks” (city dwellers) – the bad guys and “old folks” (village dwellers) – the good guys. If you belonged to the former category, you were doomed. All cities including the capital Phnom Penh were evacuated within 3 days and everyone was forced to the countryside where they had to work in fields for 12-15 hours a day under inhuman conditions. 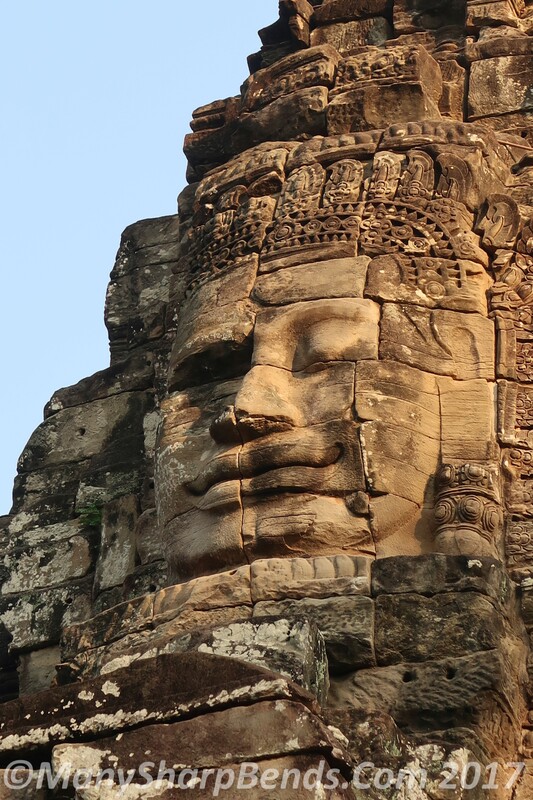 Factories, schools, transport, religious structures, offices, stadiums – were considered “evil” and destroyed. 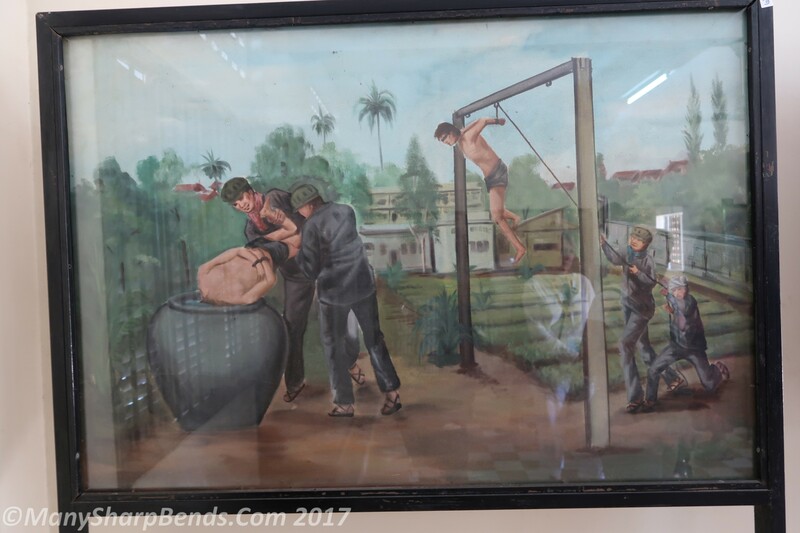 Educated folks (doctors, engineers, musicians, lawyers.. you name it) were brought to torture centers like this, imprisoned, interrogated, forced into false admissions and then executed. If you wore glasses – a visible sign of “urban excess” – you were automatically doomed ! Crazy stuff. 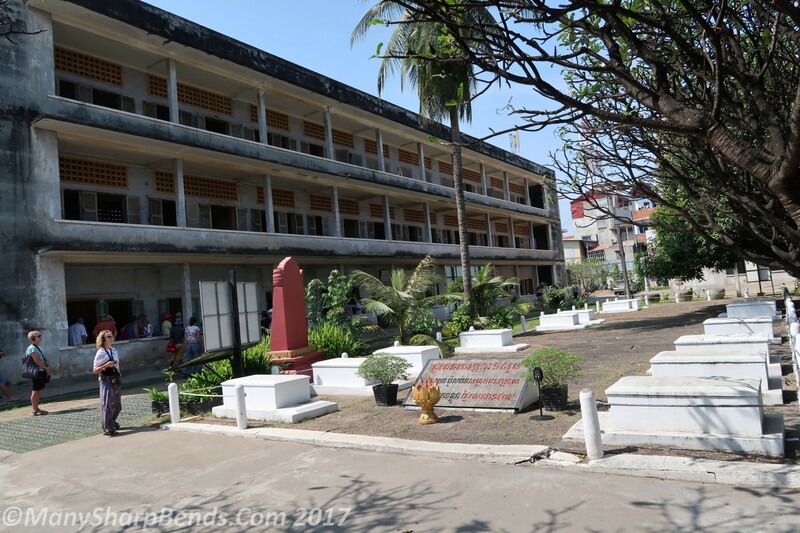 20,000 prisoners died here alone at this school-turned-prison and when KR run out of graves , prisoners were sent to the killing fields. It all sounds too horrifying to describe and we were moved to tears constantly. 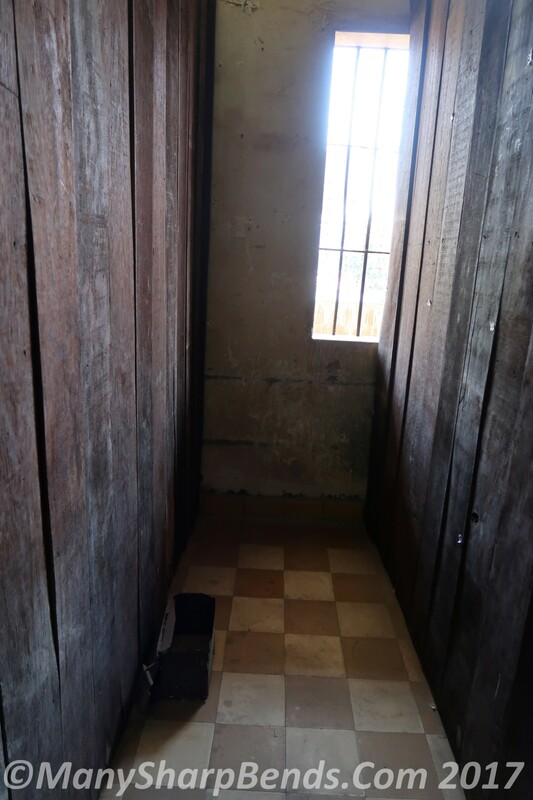 This is the main building where prisoners were kept. 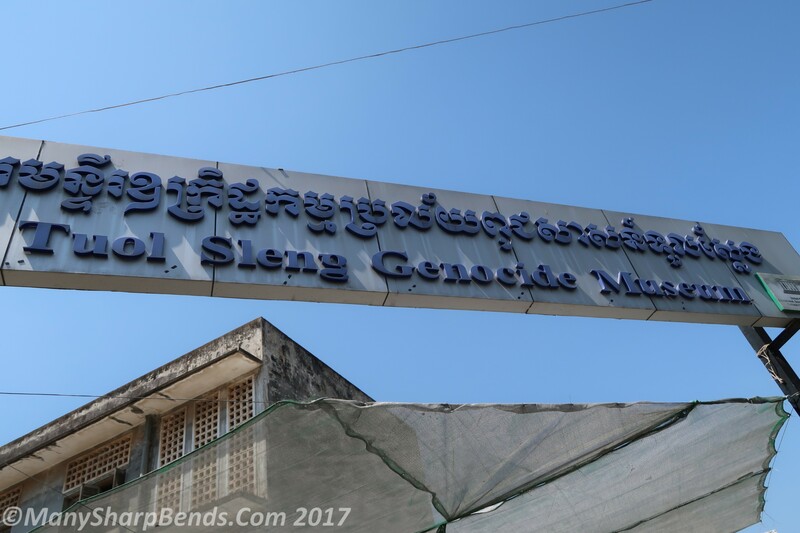 What left us stunned was the fact that a bunch of Swedes who were a part of neutral international assessment team, kept supporting Khmer Rouge; garnered international funds for them and ended up influencing the western voices who would not believe that the genocide had indeed been committed, after it was unearthed in 1979. 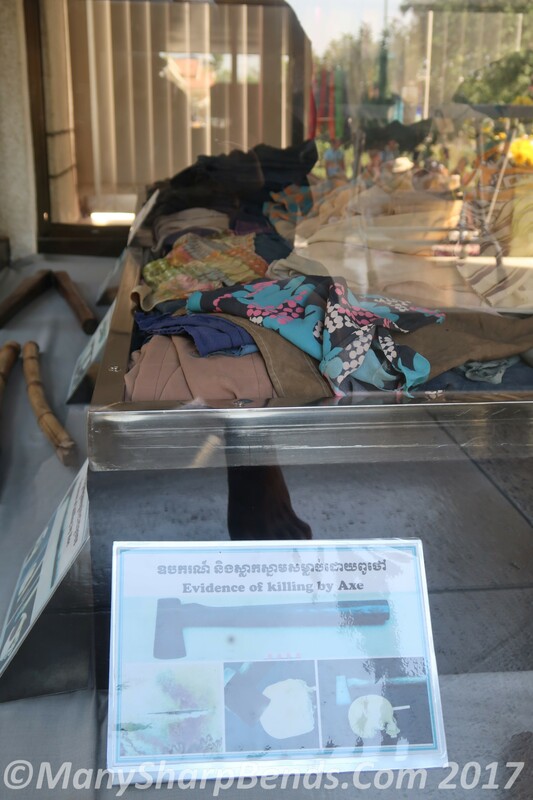 Khmer kept its seat in UN for a full 10 years and the trial only started 20 full years after the atrocities were committed. 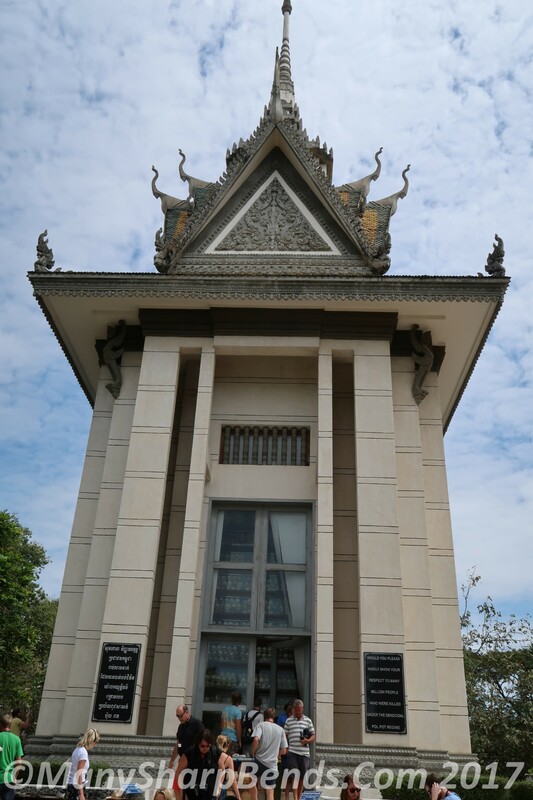 Pol Pot was never put to trial. 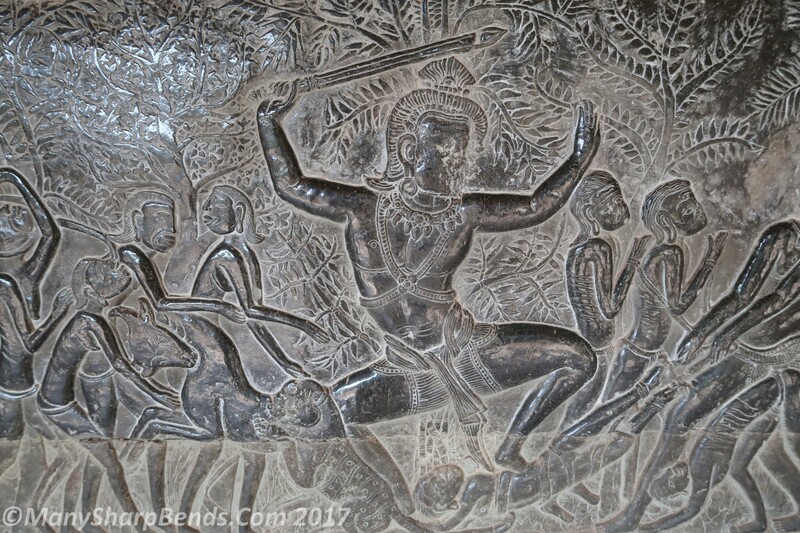 All the influential nations – US, France, UK etc were completely fooled and did nothing to bring justice to Cambodians. 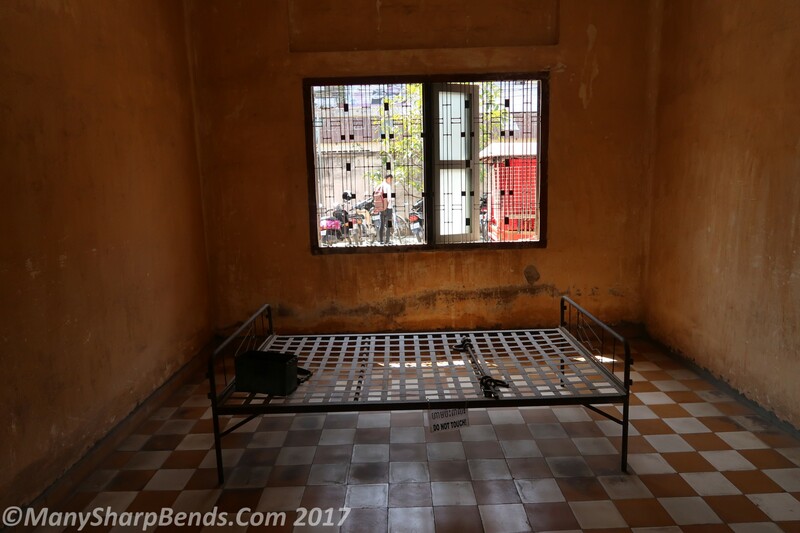 They chose to believe the stage-managed glimpses of the country organised by Pol Pot rather than the harrowing tales of refugees who had managed to escape. 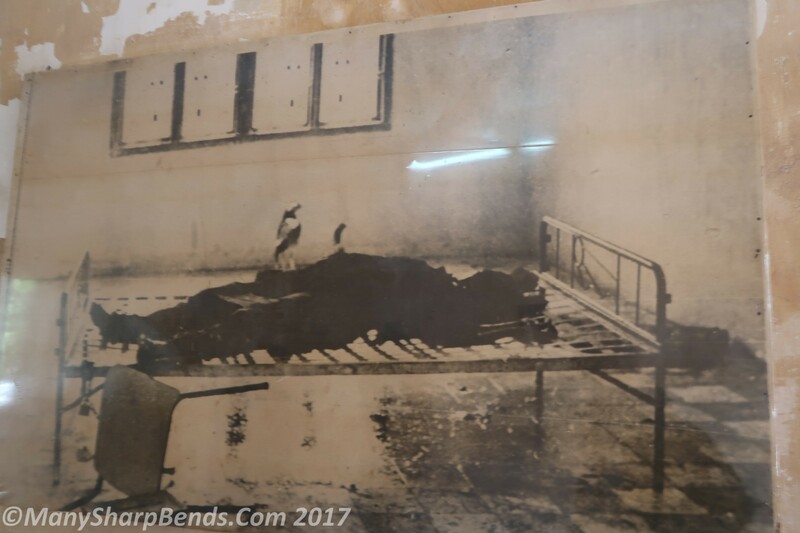 Crazy stuff that shook us to the core !! 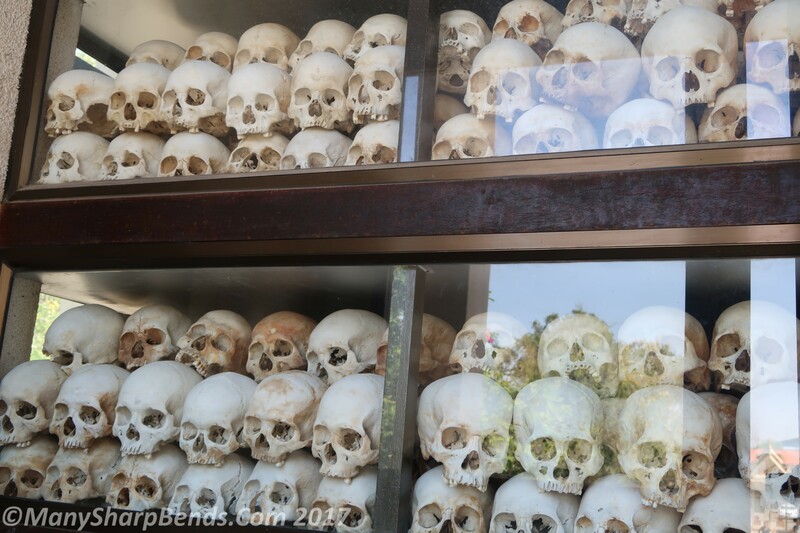 We came away very disturbed and headed to Empire cinema/restaurant to watch the award-winning movie “Killing fields” to go in depth into the genocide. Another Indian dinner rounded up a highly emotional and disturbing day. 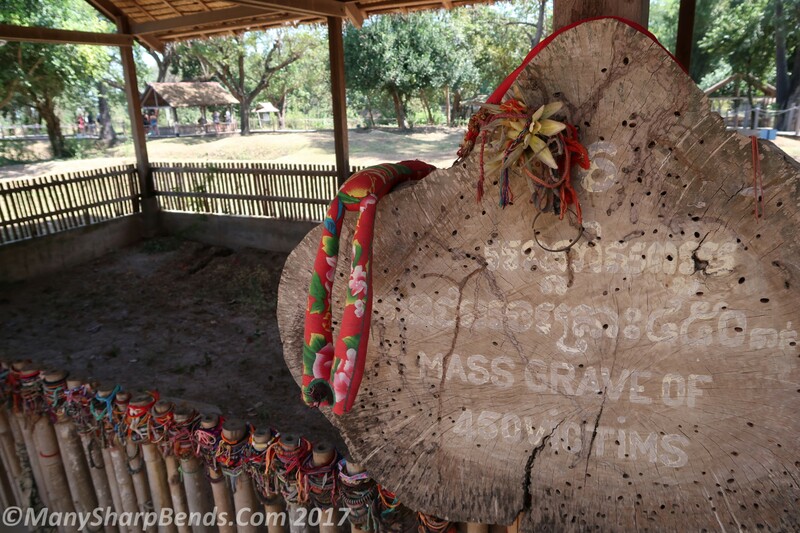 The next morning we visited the Choeung Ek killing fields – part 2 of the genocide, containing mass graves of Cambodians, about 17 kms south of the city. 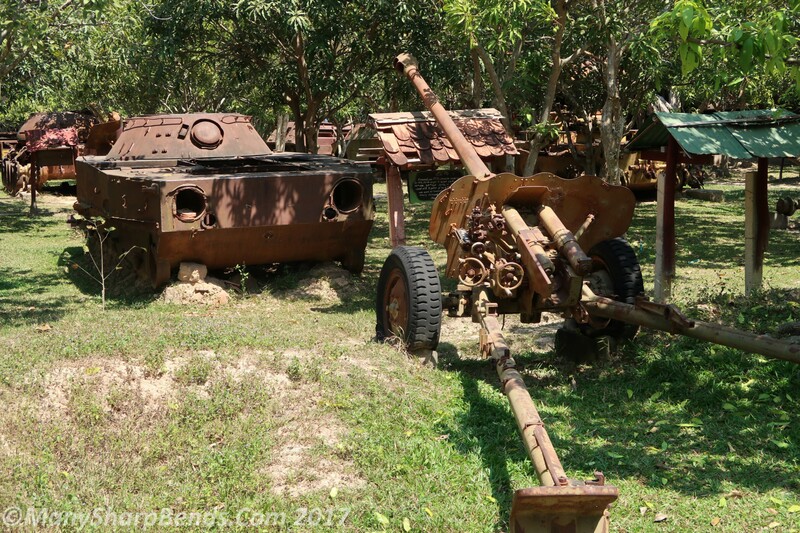 To take us there we had booked the services of Huot based on great reviews on TripAdvisor. Found him to be a genuinely warm and extremely sharp person with whom we could discuss a whole lot of things, the political situation, the state of education, mindsets of the people, etc. We learnt so much ! 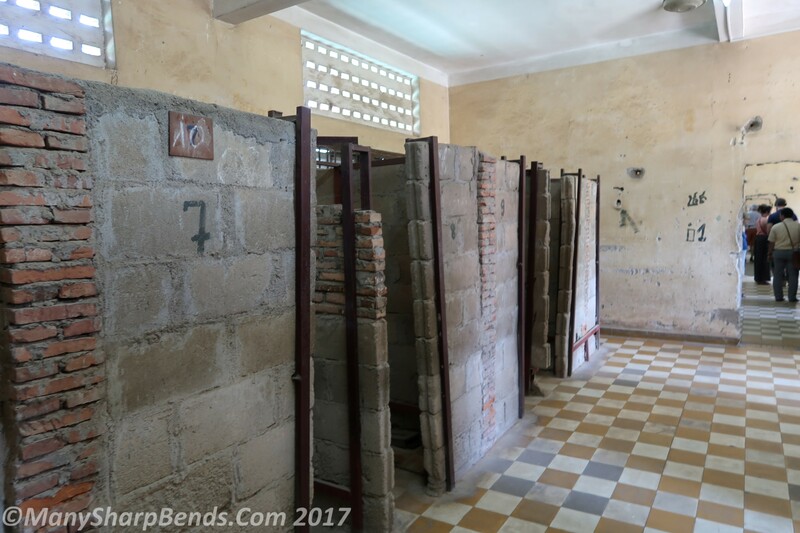 When Khmer Rouge ran out of burial spaces in the torture centers (like the one we visited yesterday) it devised an evil plan to kill people en-mass in these killing fields. 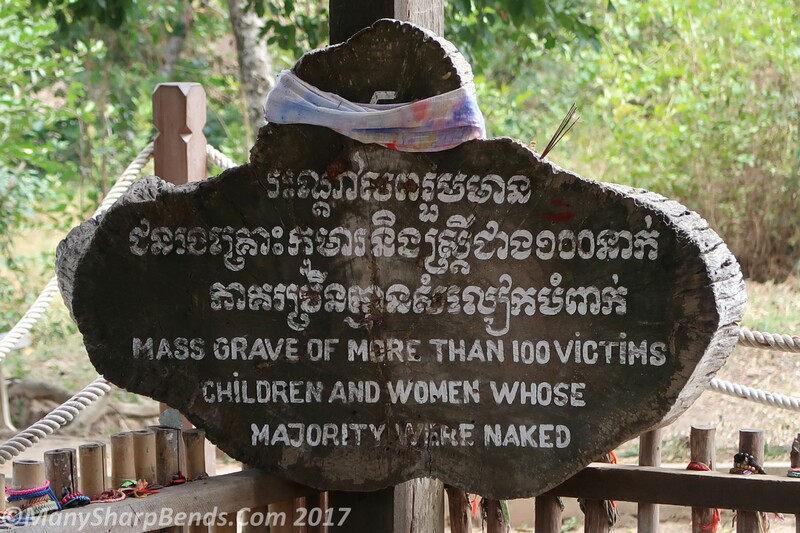 Prisoners were brought here in the dark of the night by trucks, hacked to death and thrown in a mass graves. 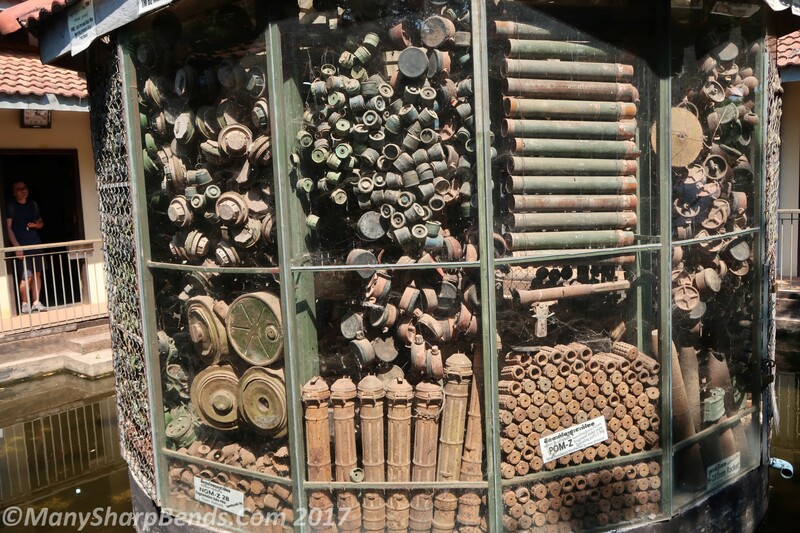 Bullets were expensive, so metal tools were used to kill. Babies were killed by smashing their heads against trees ! By morning, pits would be covered. All of this sounds too horrible to be true ! 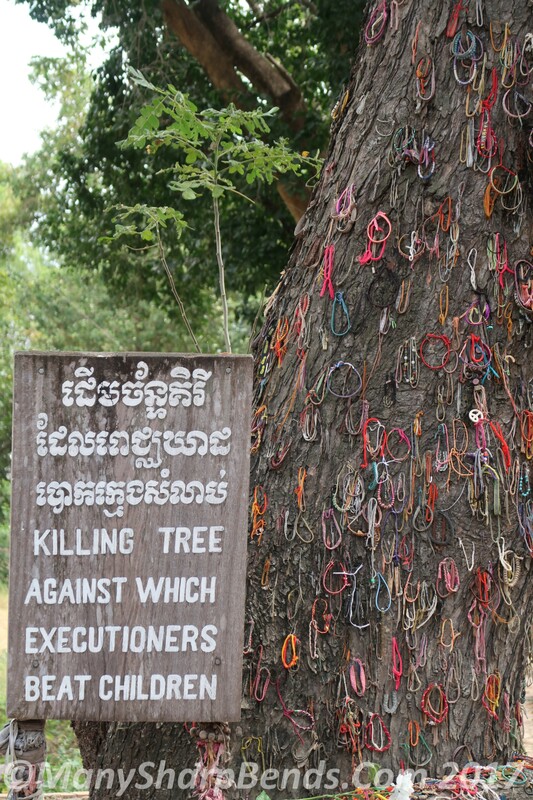 Remember there were 300 killing fields like this – we only visited the main one. What did we learn? It takes only one demented leader to screw a country for generations. If people are educated, their chances of being brain washed by extremist ideologies, can be reduced. Even that is easier said than done, as demonstrated in Germany. What of other countries who watch in silence ? They are equally responsible. 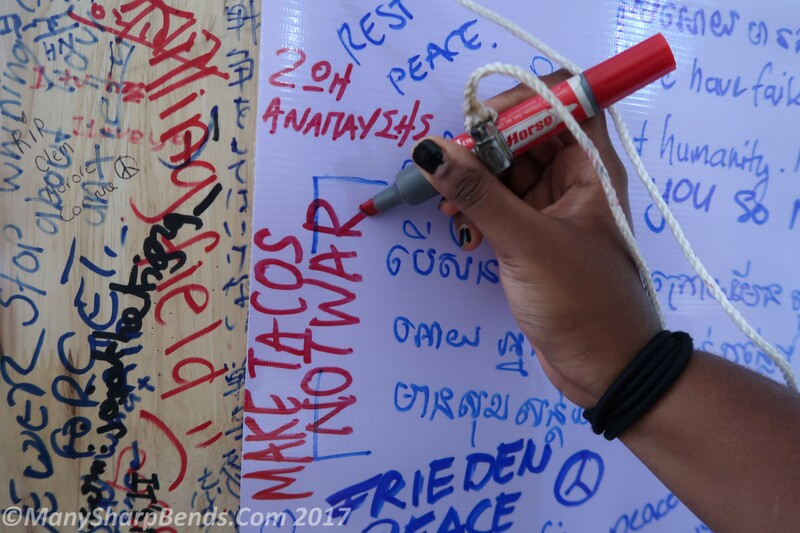 If the world community stood up in these moments of horror and took prompt action, these genocides would never occur. 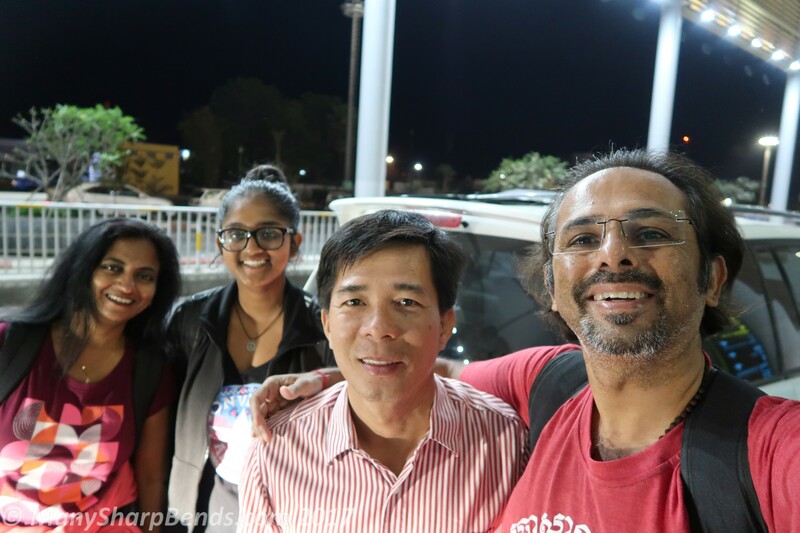 Since we were so happy to have chatted with Huot and found him a genuine Cambodian, we engaged his services again the next morning to drop us to the airport. On the drive we learnt this wonderful man who is very fortunate to have survived the Khmer Rouge years, (separated from his parents as a toddler and then fortunately reunited) manages an orphanage for children impacted by landmines. 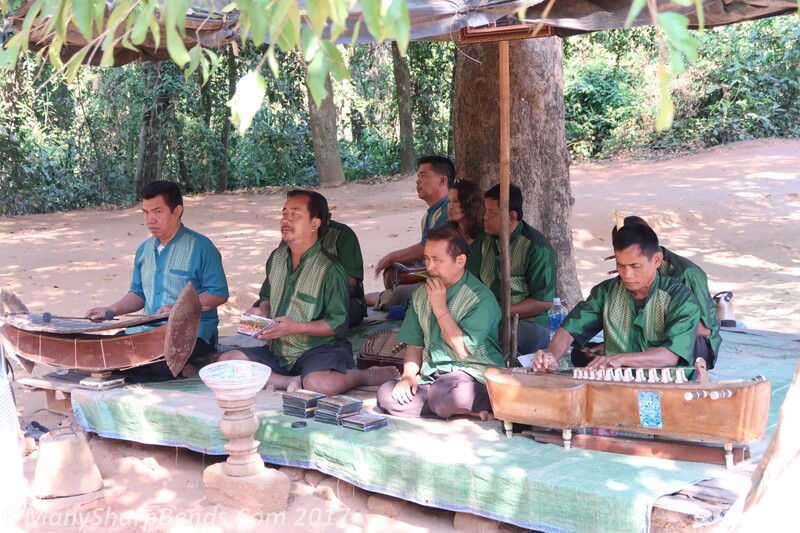 In summary, we were amazed to note the resilience of the Khmer people. How they have rebounded from their trauma, buried their hatred for direct and indirect perpetrators and rebuilt the country from scratch in the last 30 years is an example for the world on how to overcome adversity and move on. 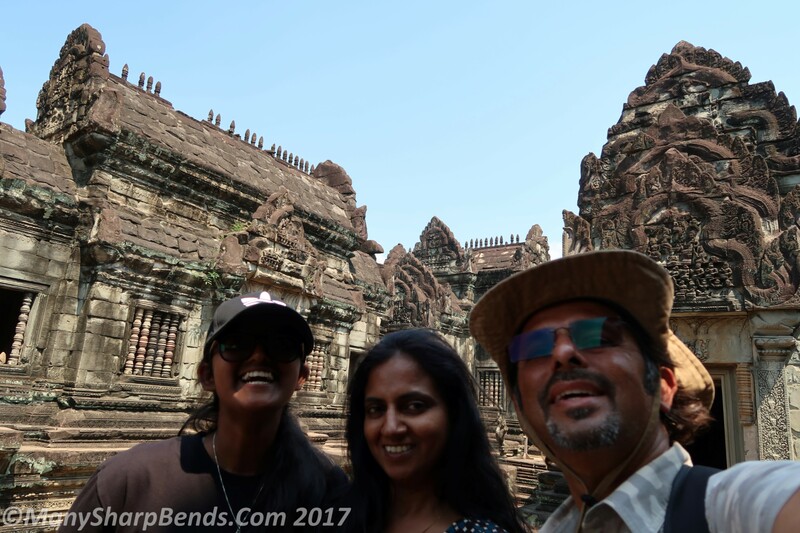 Cambodia – you are our favorite destination of our entire trip and will remain etched in our hearts for ever. Love and good bye.